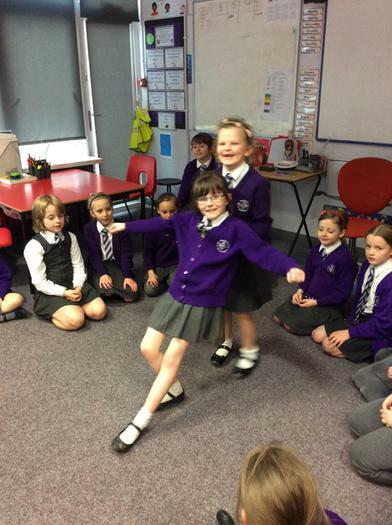 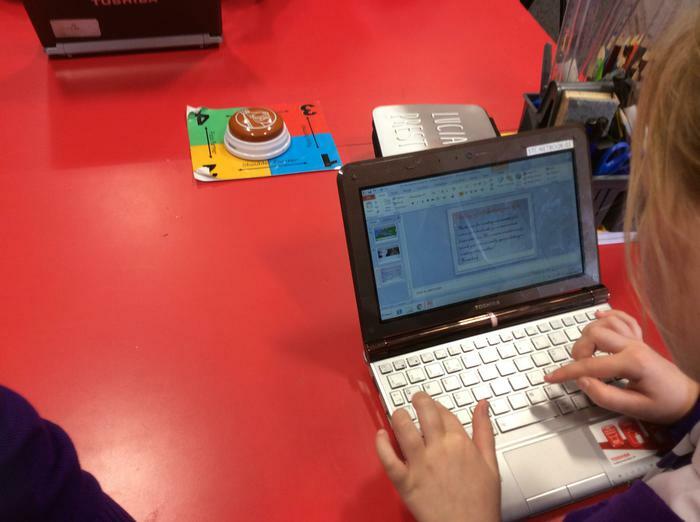 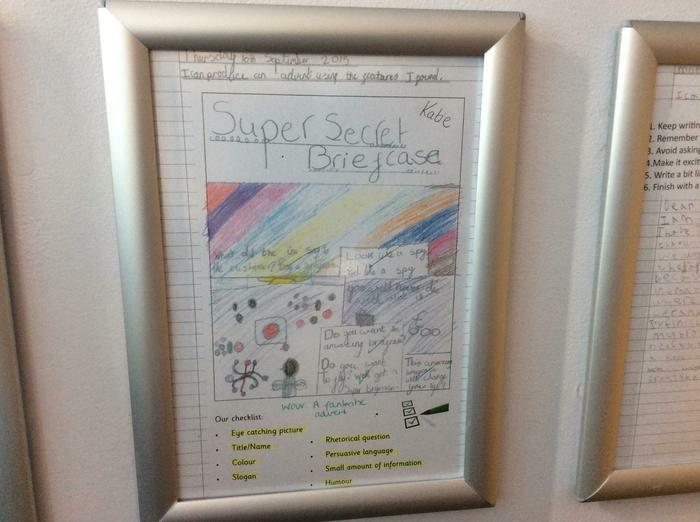 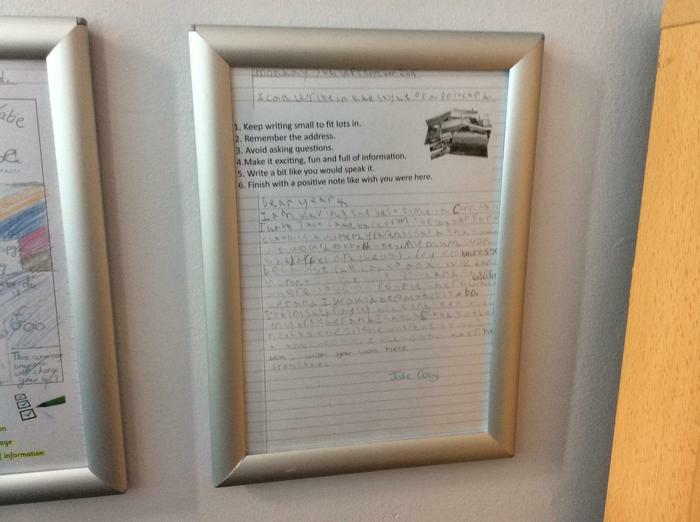 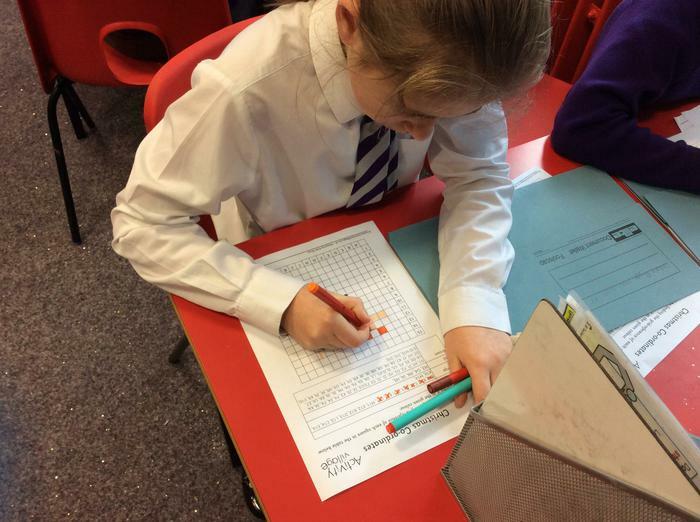 On this page you will find examples of all the brilliant work we do in Year 4. 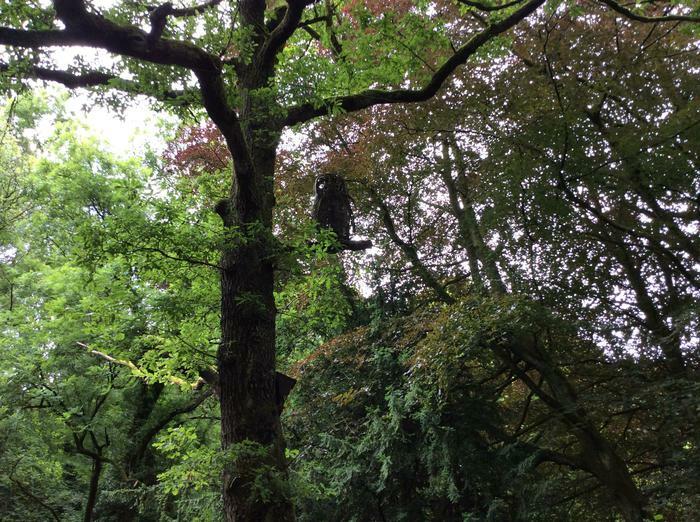 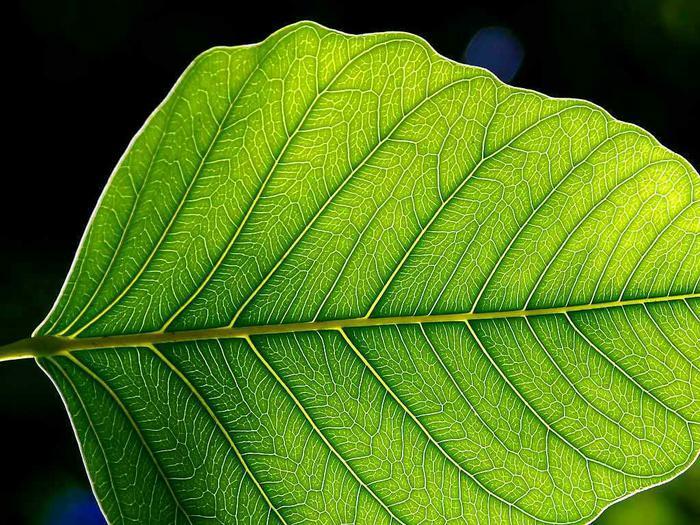 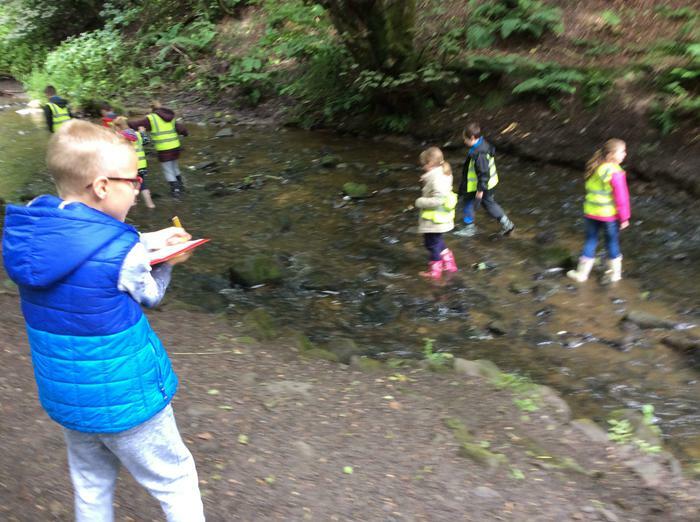 Take a look to see if you can see the work of someone you know. 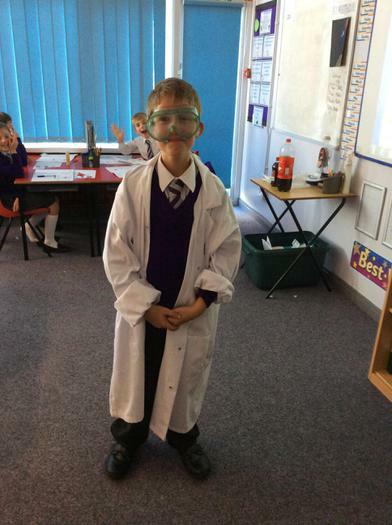 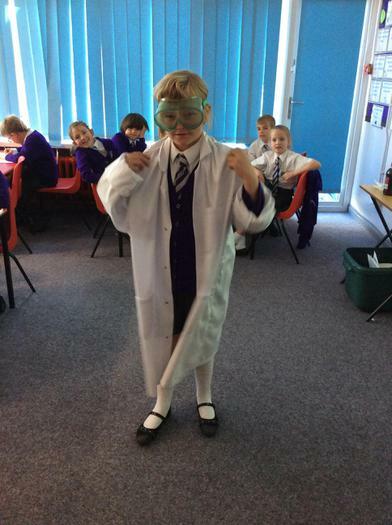 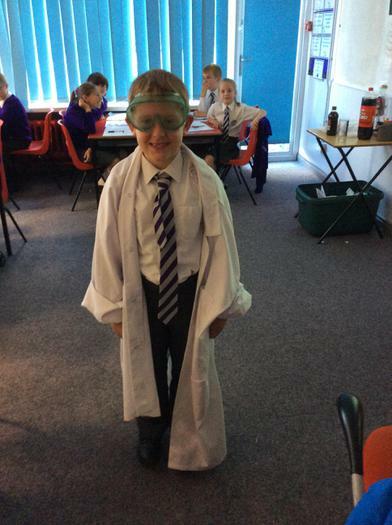 We have been looking at the effect certain substances has on our teeth. 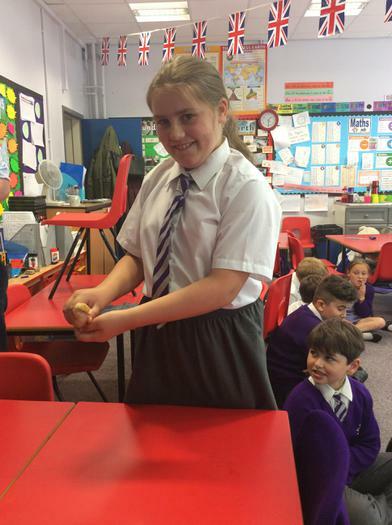 We submerged an egg into coca cola, vinegar and water and then monitored the effects. 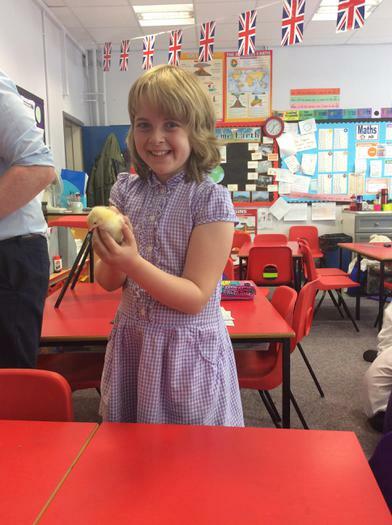 The surface of the egg represents the enamel on our teeth. 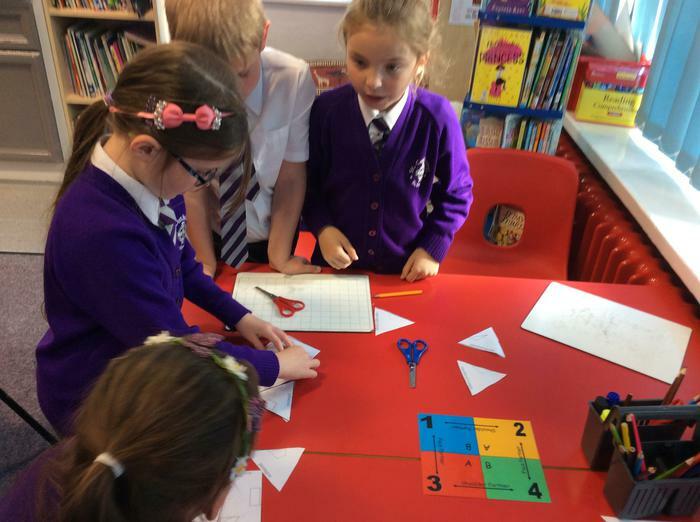 Working in teams we solved a puzzle that involved matching up some unusual shapes with their correct names. 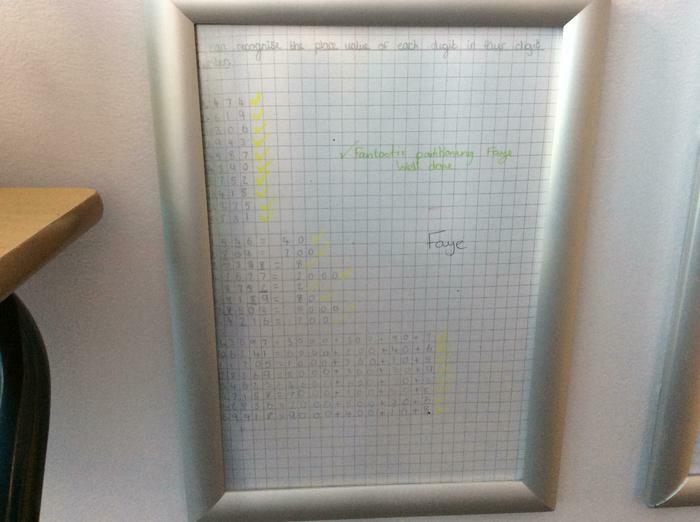 We had to make sure the whole puzzle came together in the correct way or else it would not work. 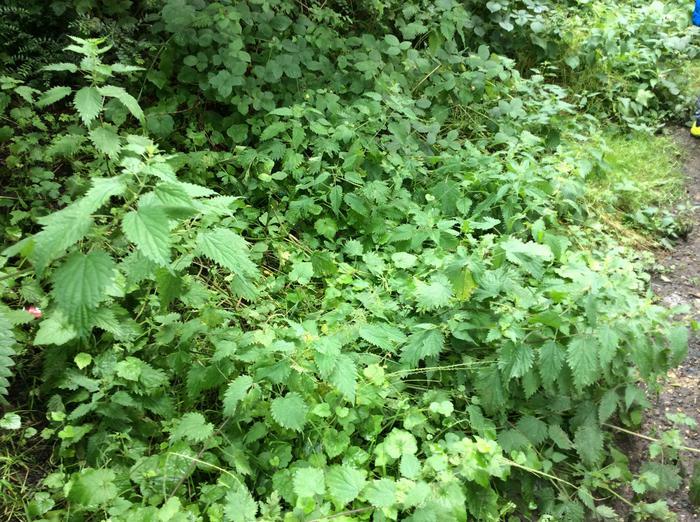 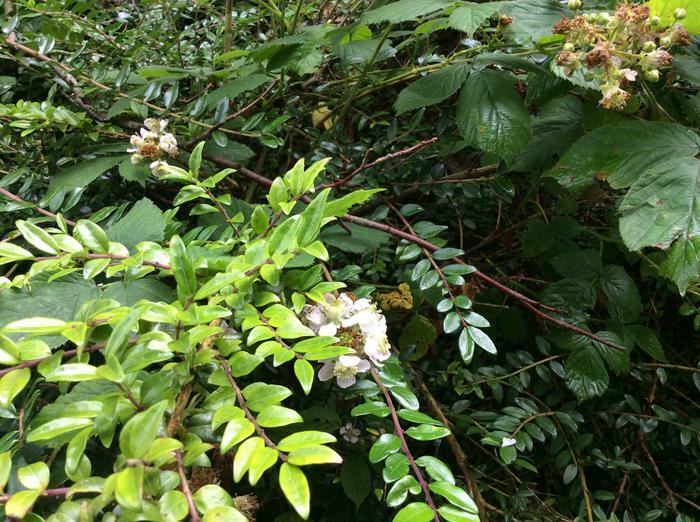 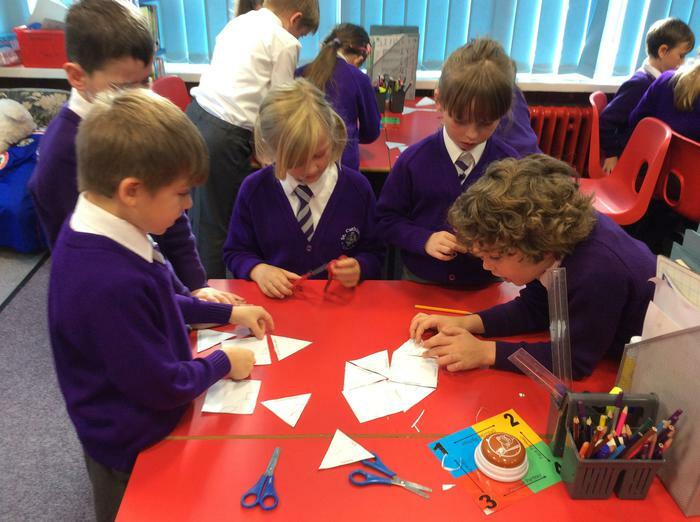 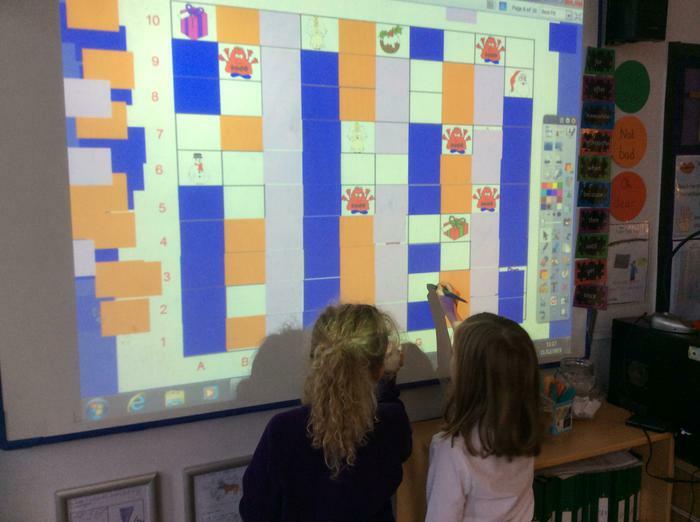 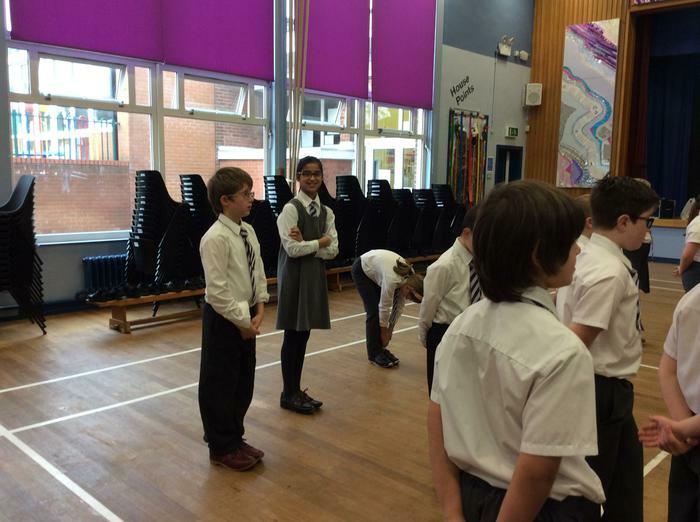 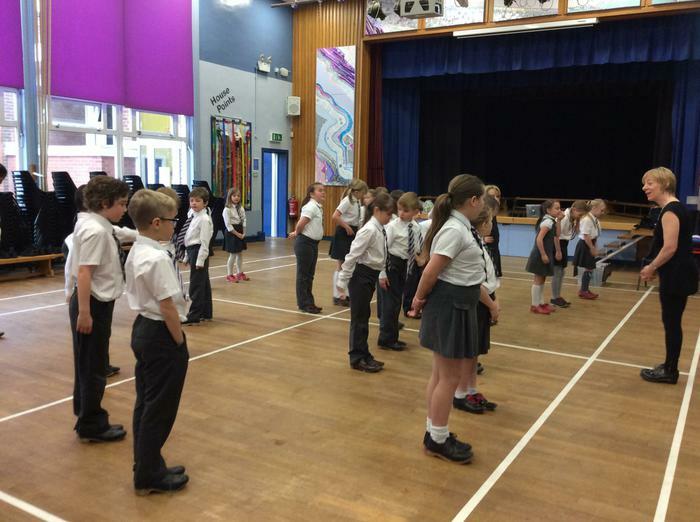 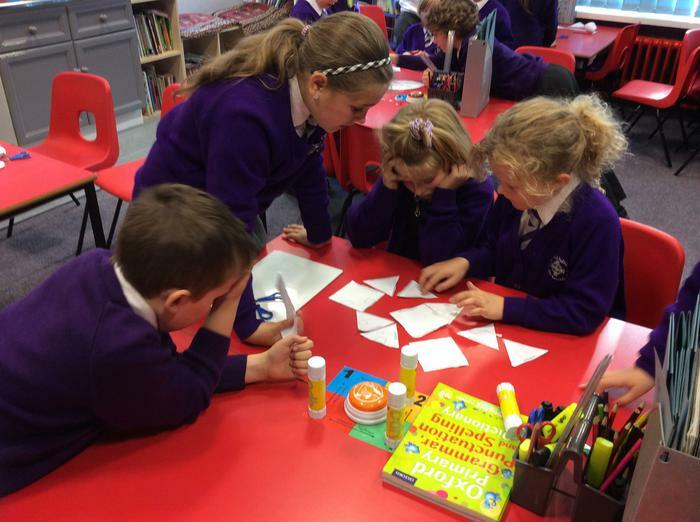 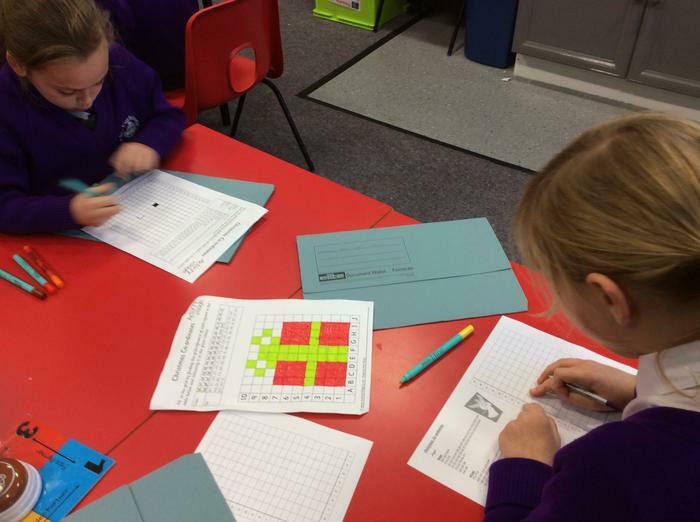 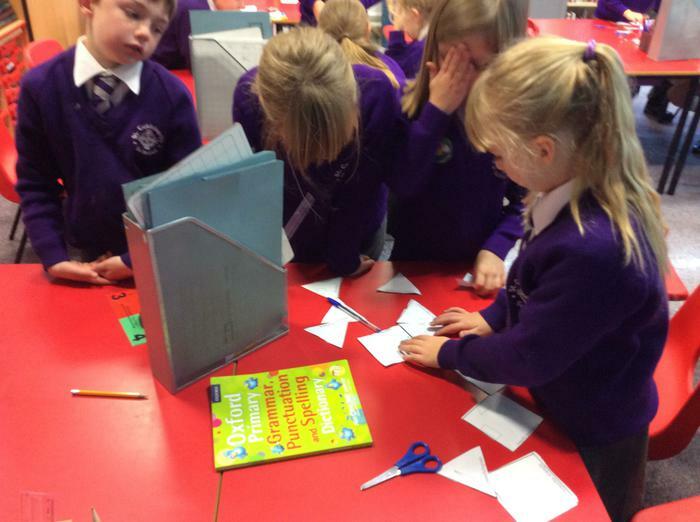 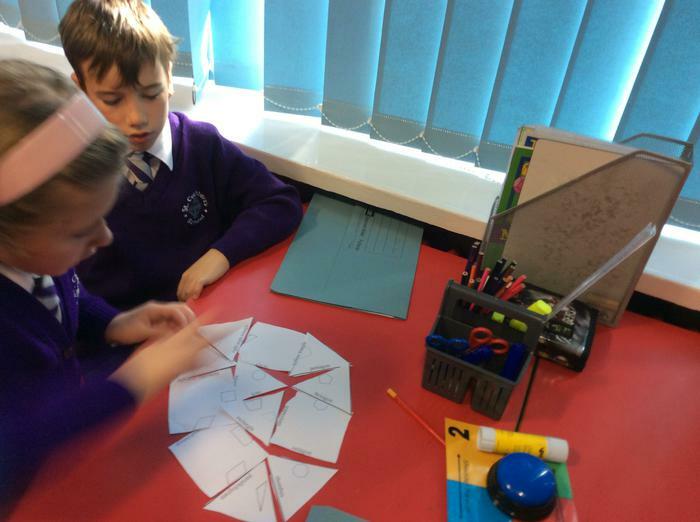 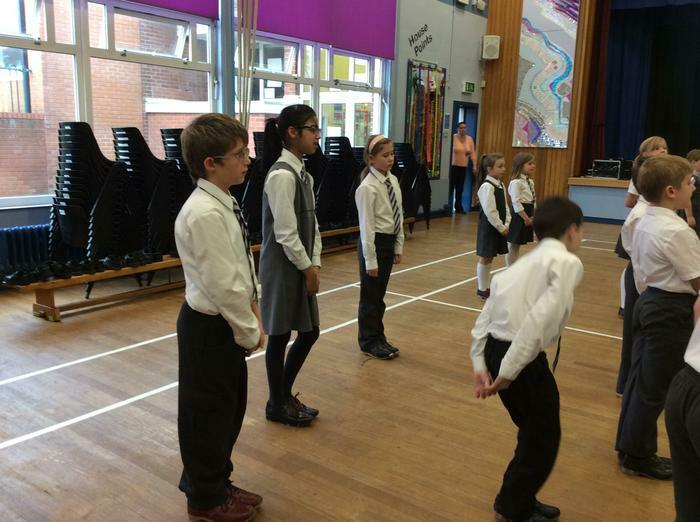 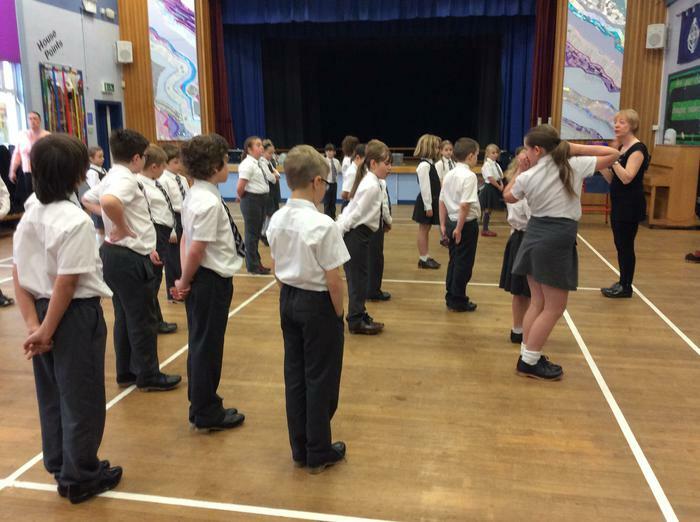 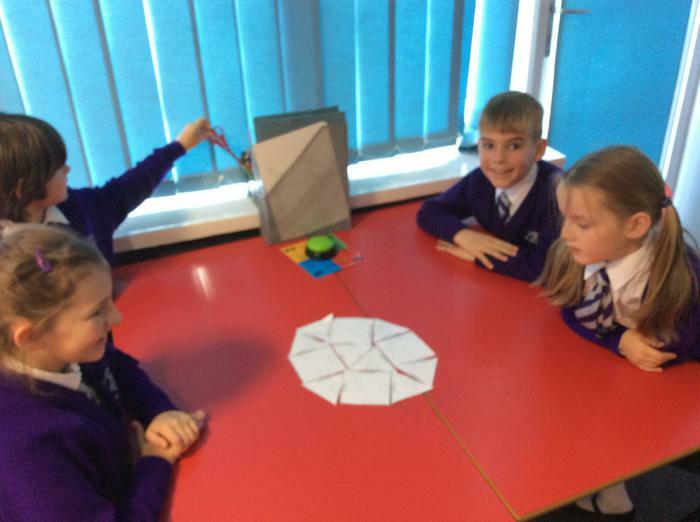 Click on the pictures below to have a go at some of the maze games we have created in class. 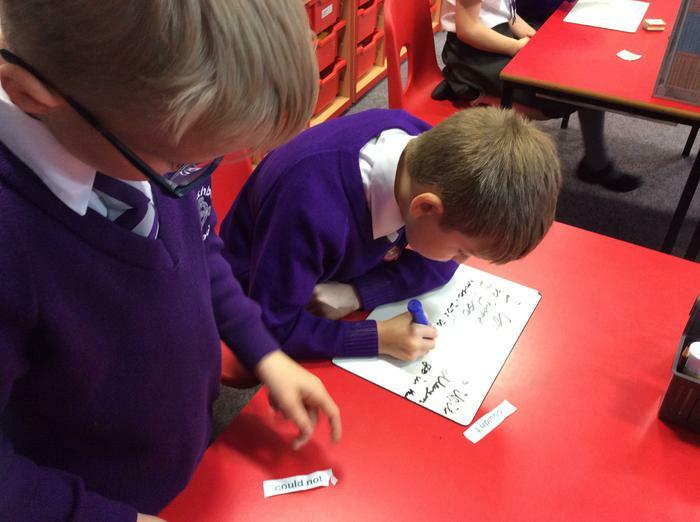 We have been learning how to contract words by adding an apostrophe. 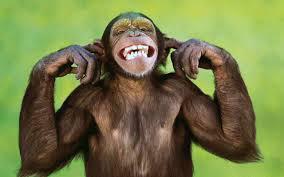 This is for words like don't, can't and wouldn't. 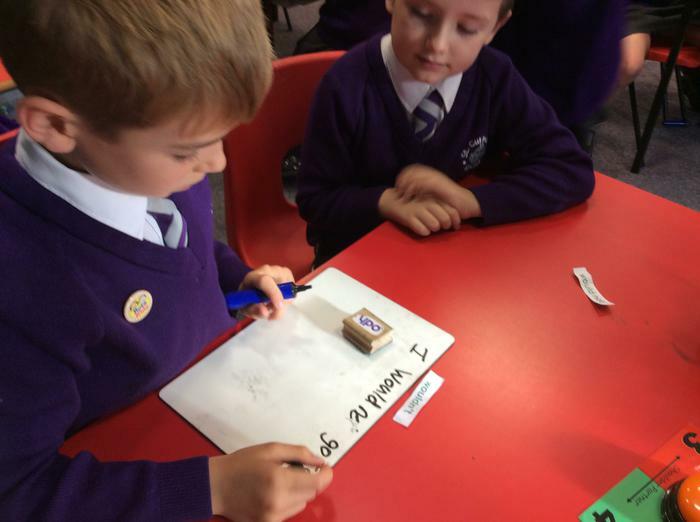 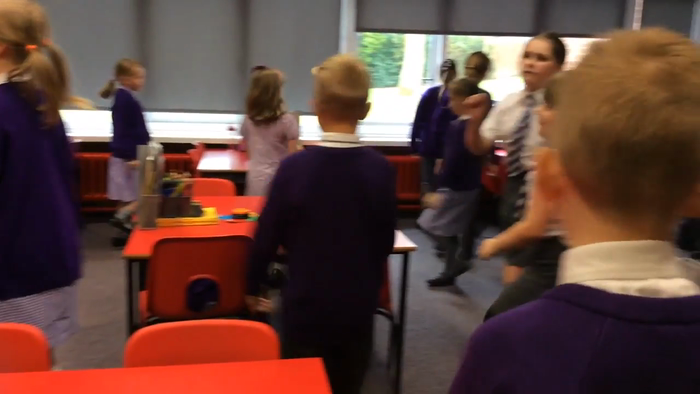 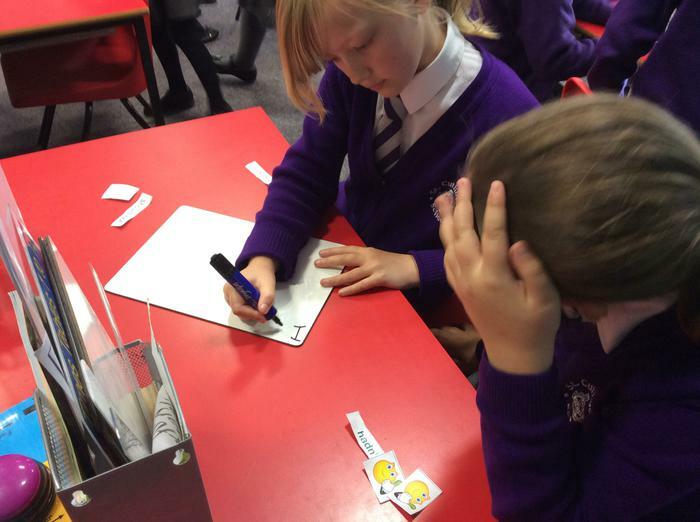 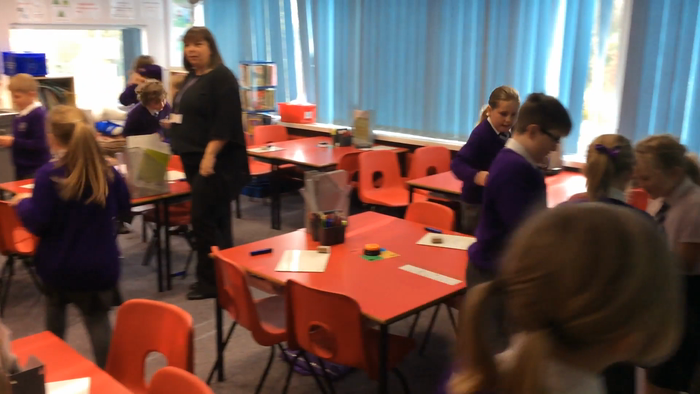 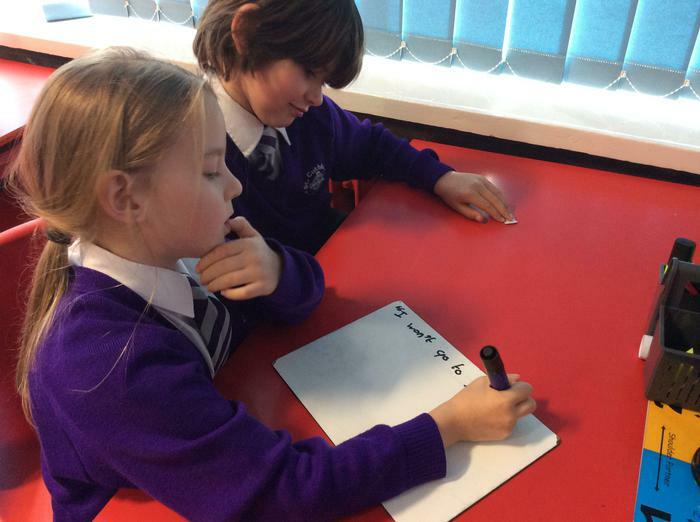 To do this we played a whole class pairs game to help us remember the words and had lots of fun doing so. 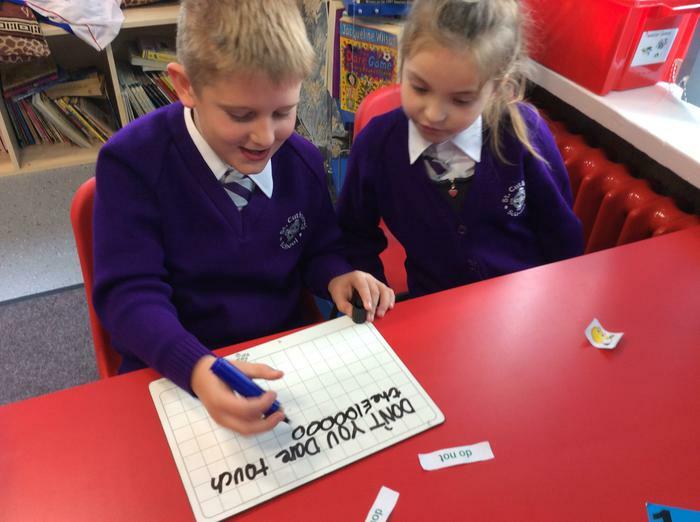 Some pictures of us putting the contractions into a sentence with our partners to coach us. 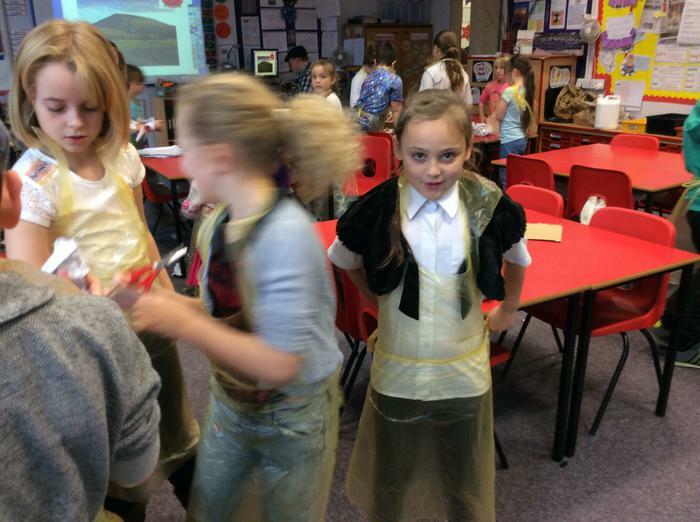 This week at St Cuthbert's it is Lancashire Week. 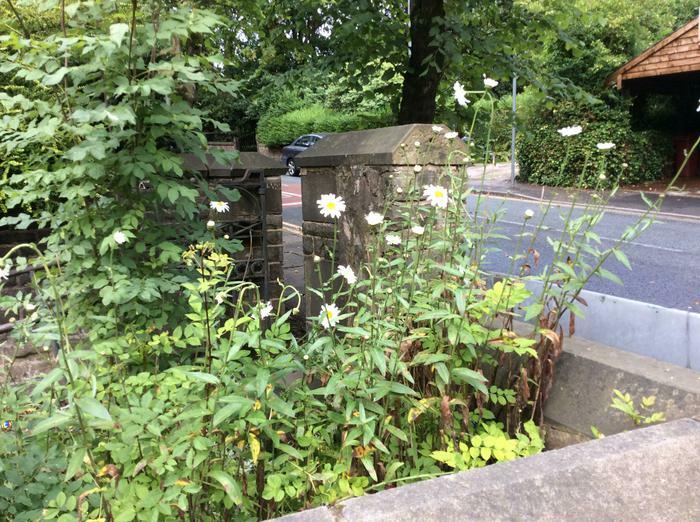 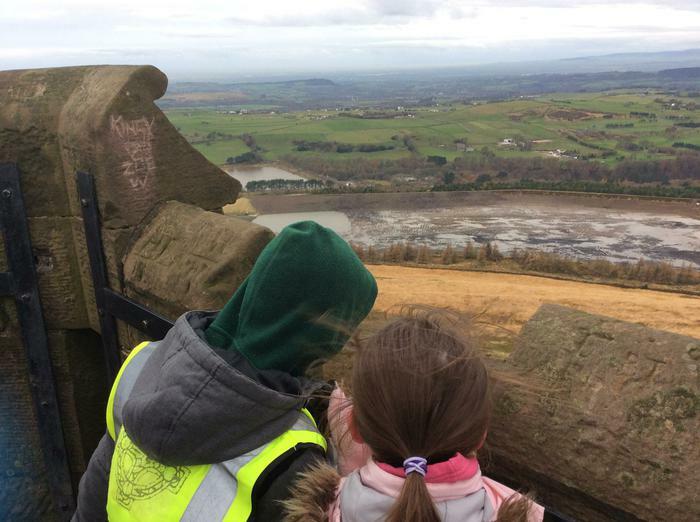 We will be completing lots of activities based around our wonderful county of Lancashire. 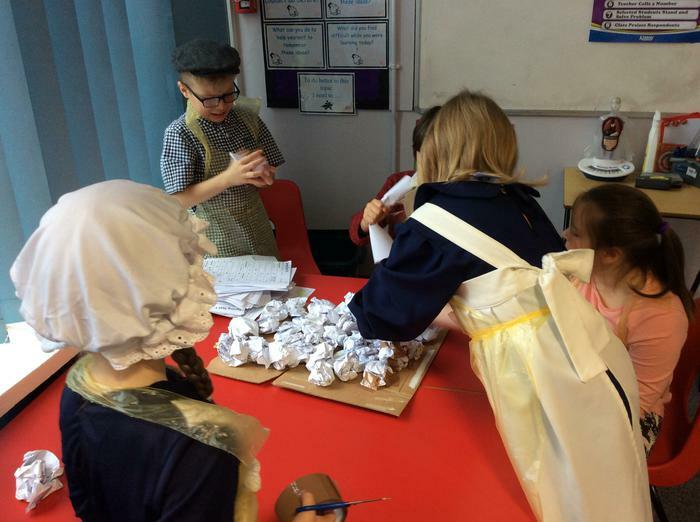 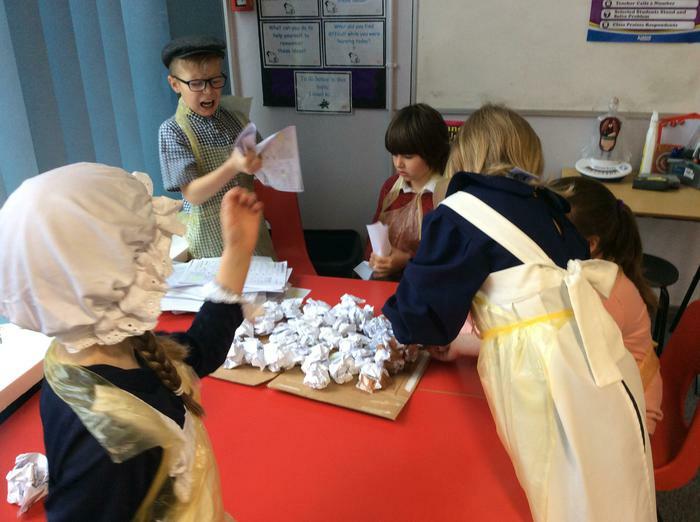 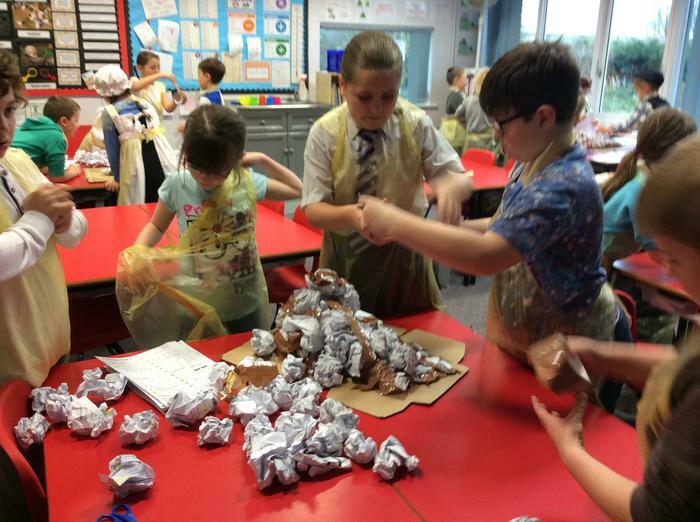 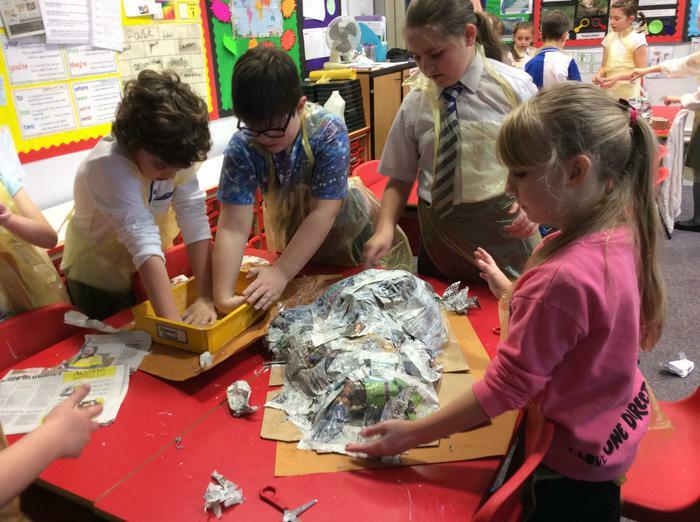 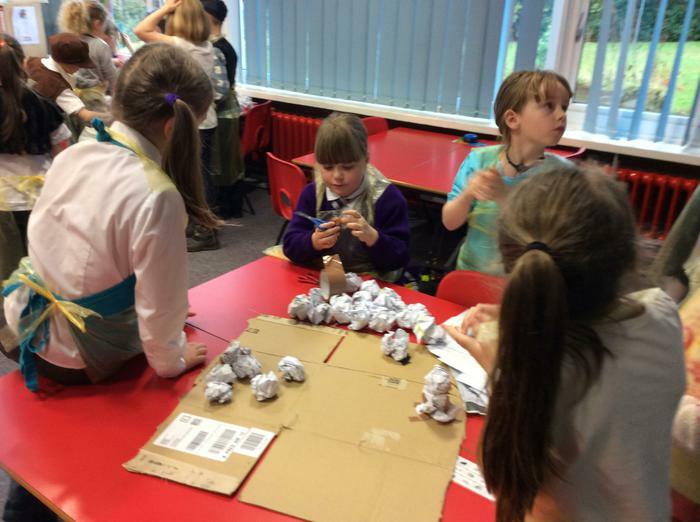 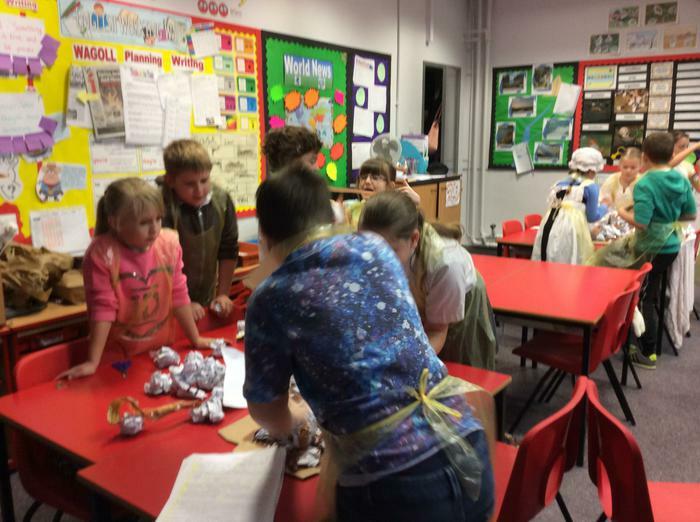 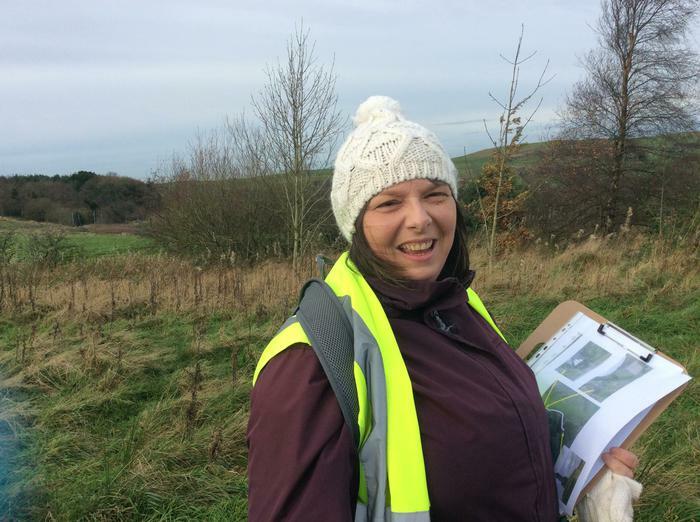 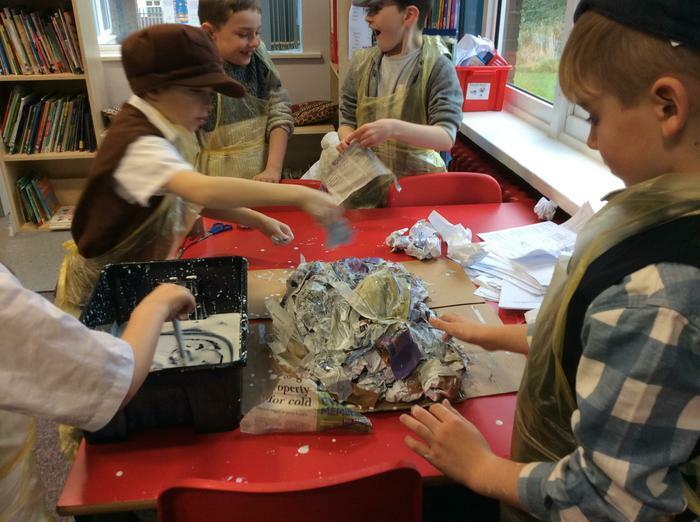 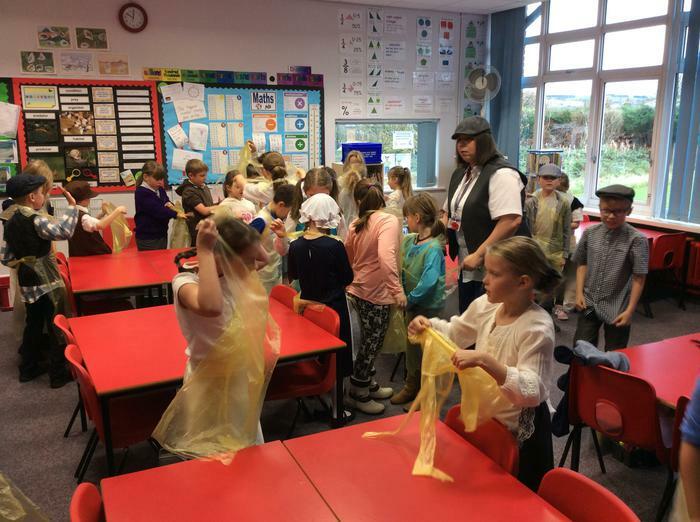 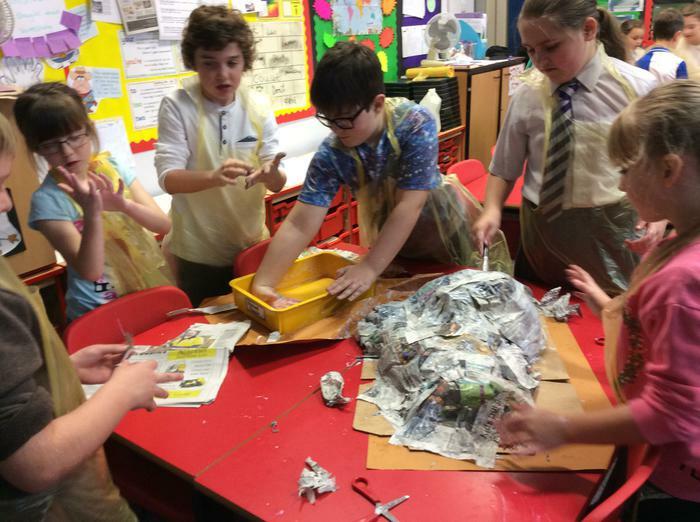 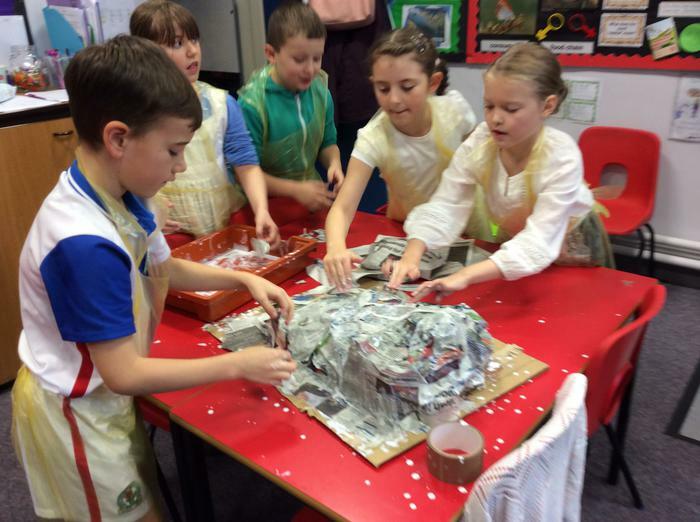 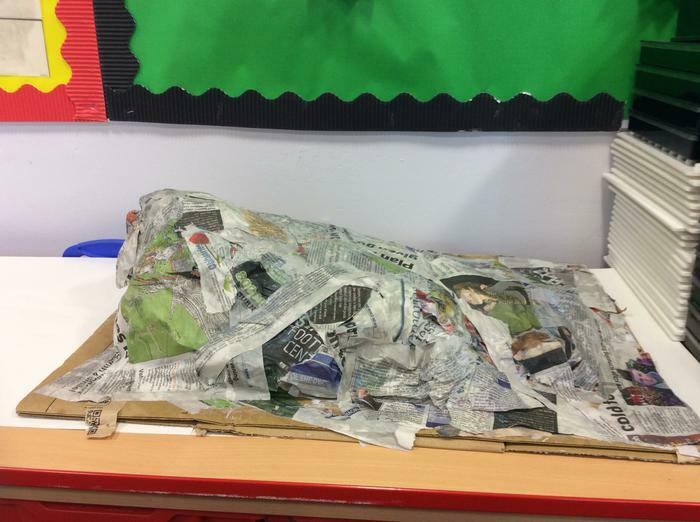 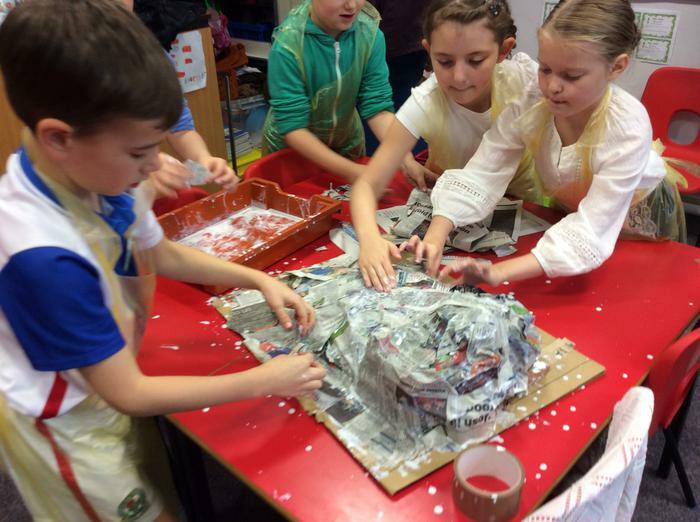 We will be looking at how many people live in Lancashire and making bar charts, having a look at weaving to make some Christmas decorations, making wanted posters for the Pendle witches and finishing the week by making Pendle Hill out of paper mache. 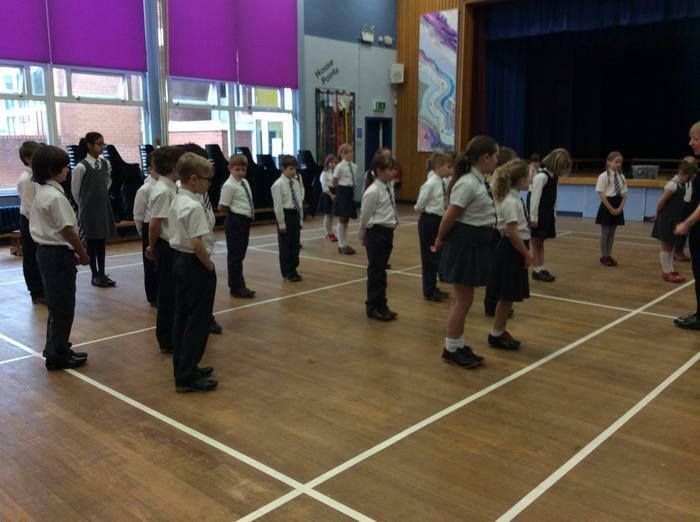 Aswell as all of that we will be taking part in a clog dancing class and enjoying a Lancashire lunch. 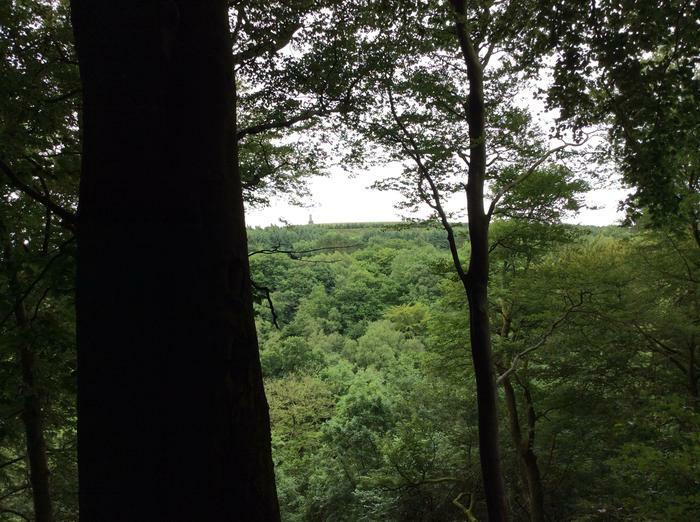 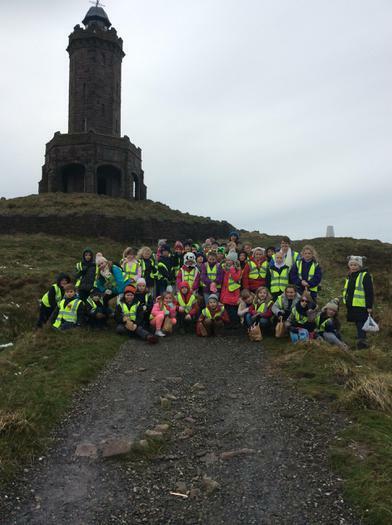 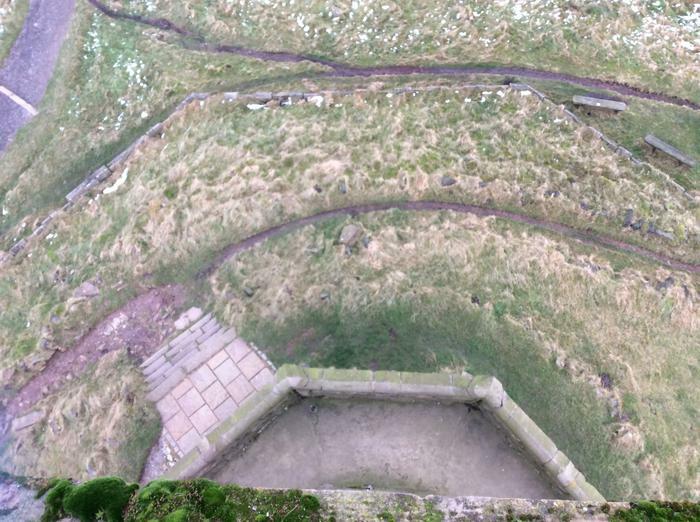 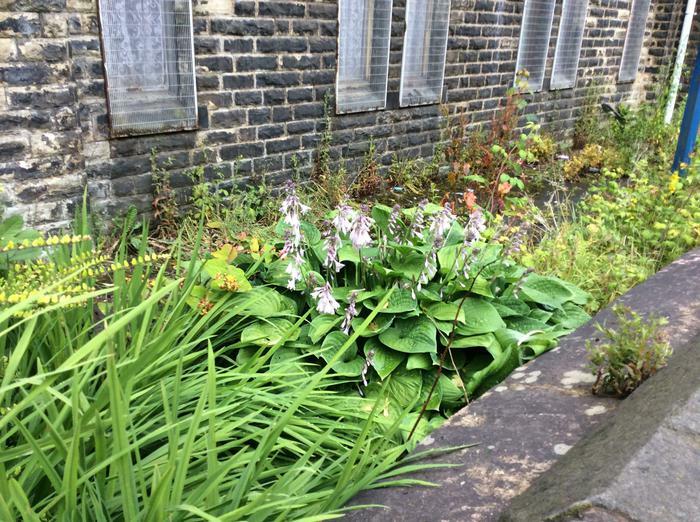 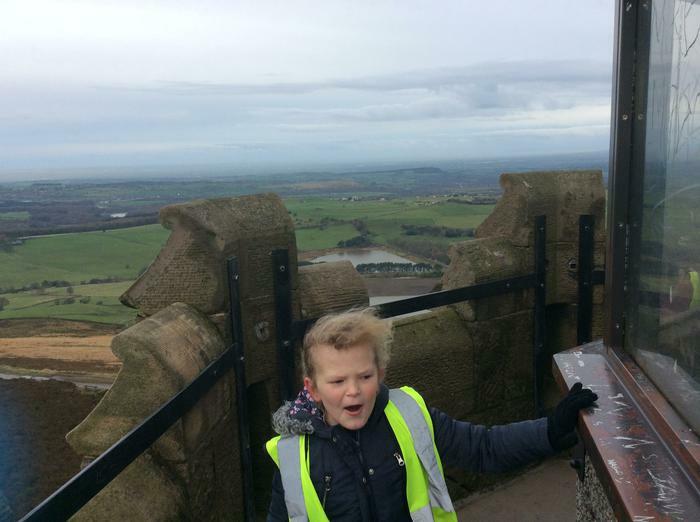 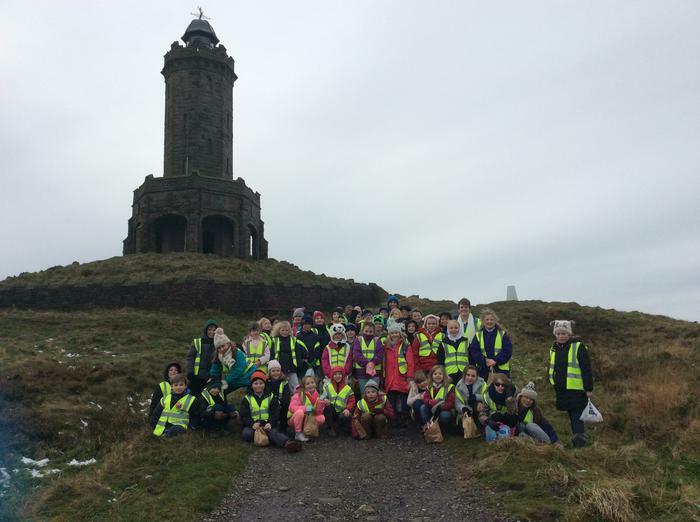 Monday 23rd November 2015 - A visit to Darwen Tower. 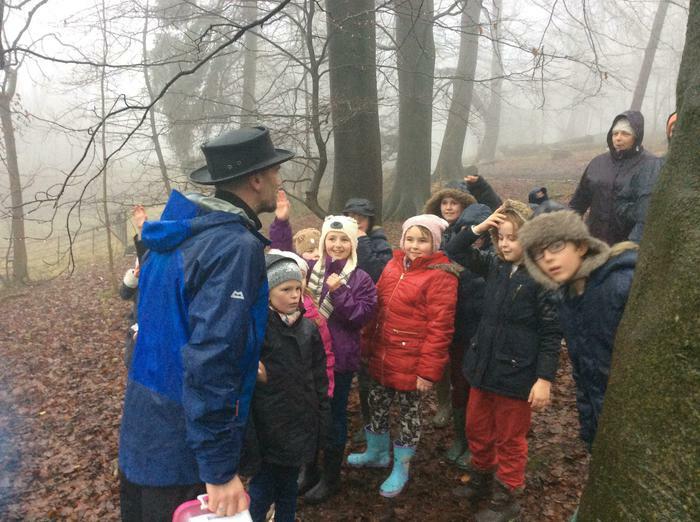 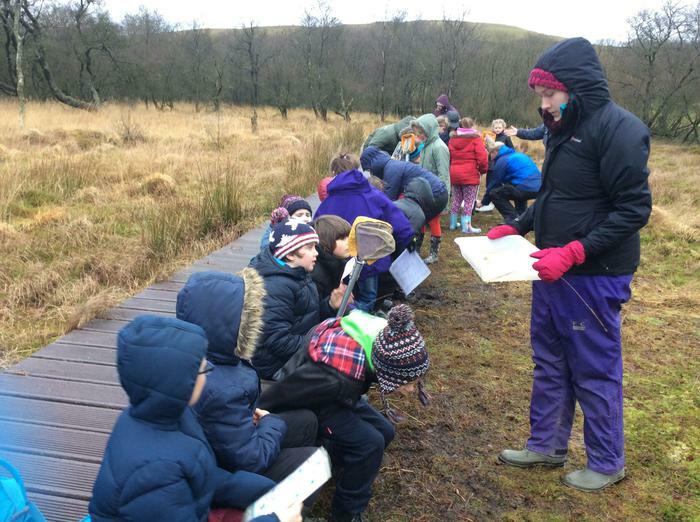 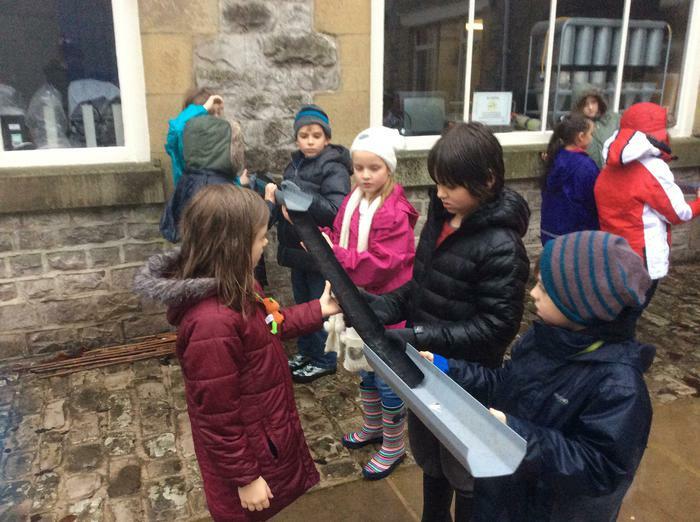 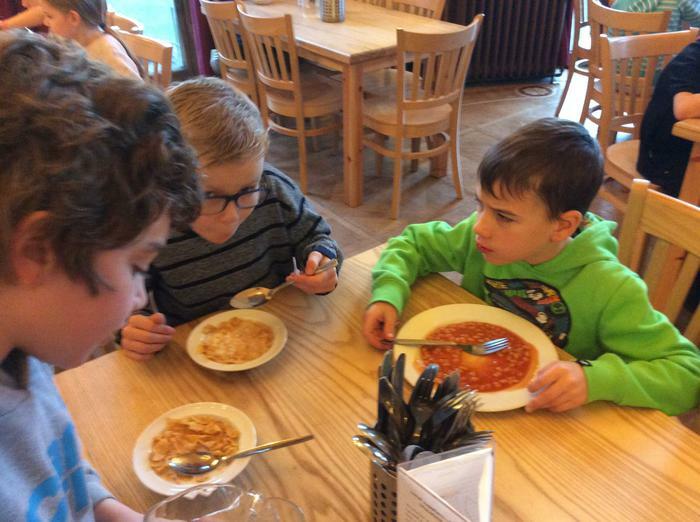 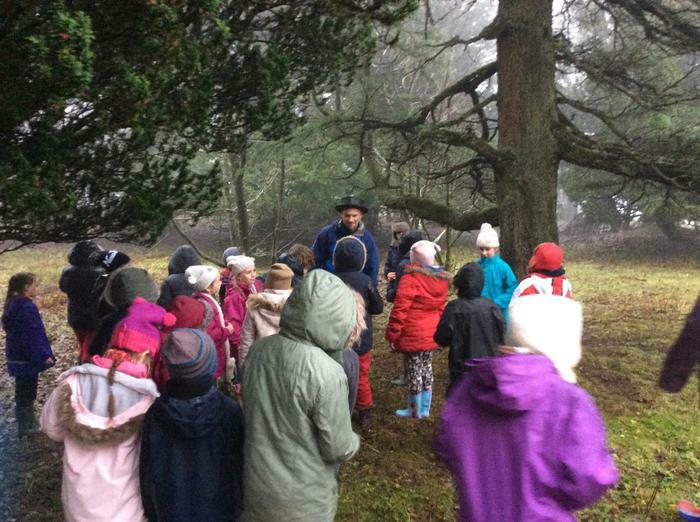 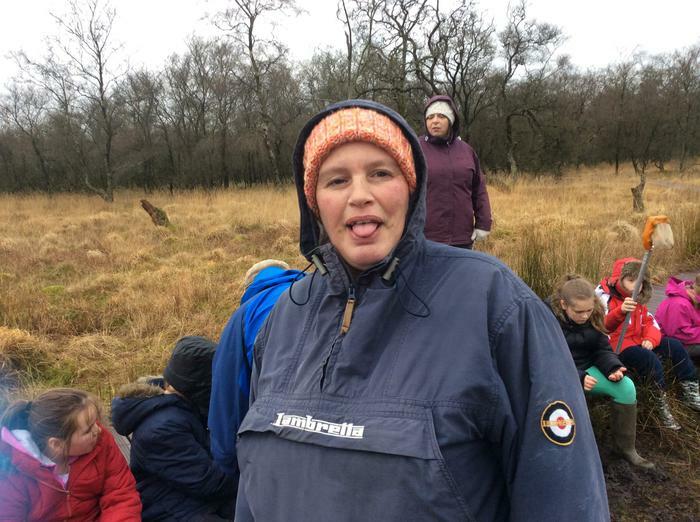 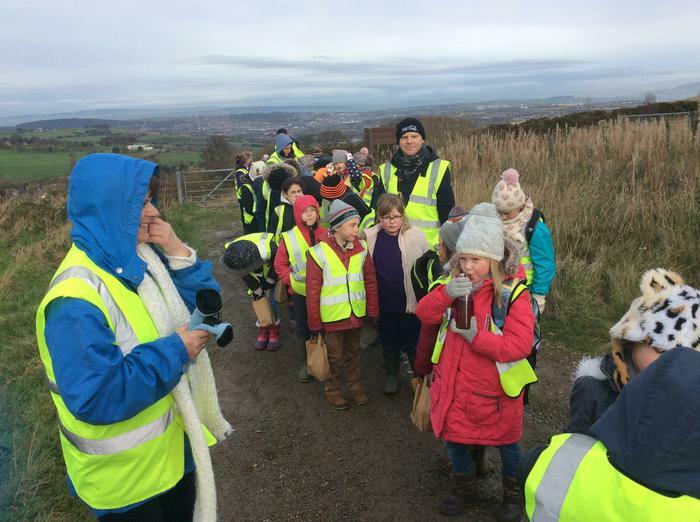 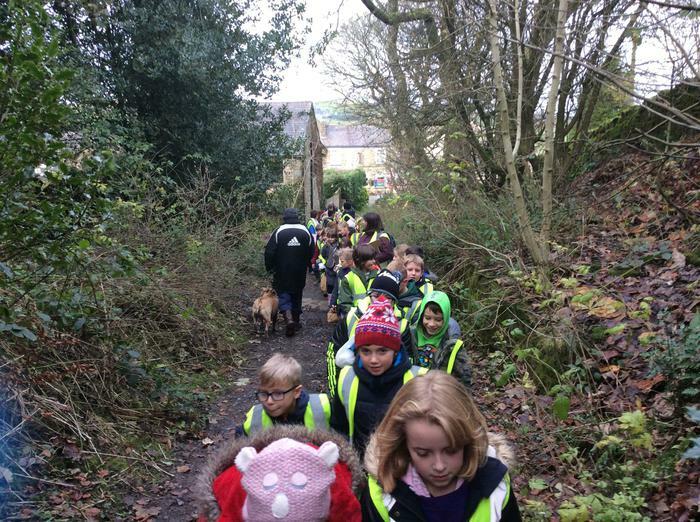 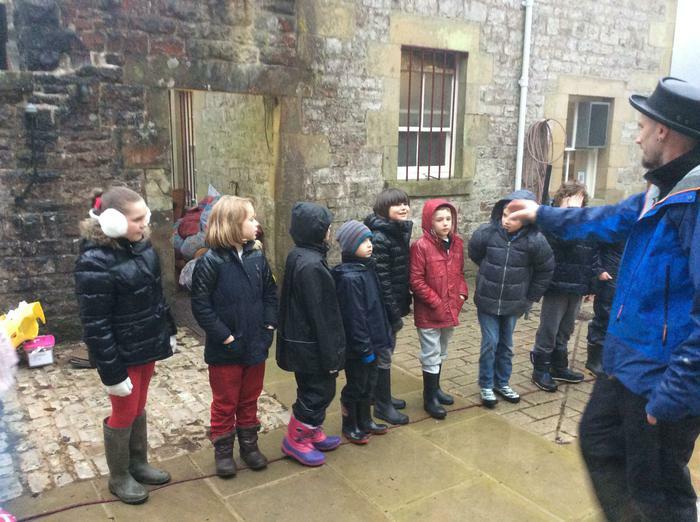 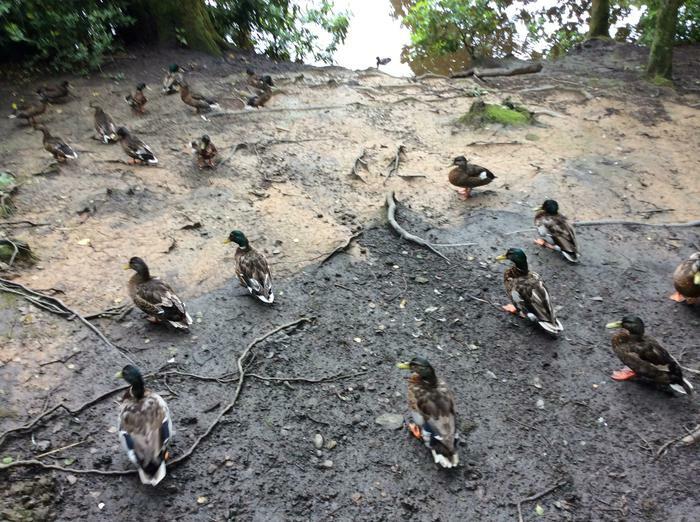 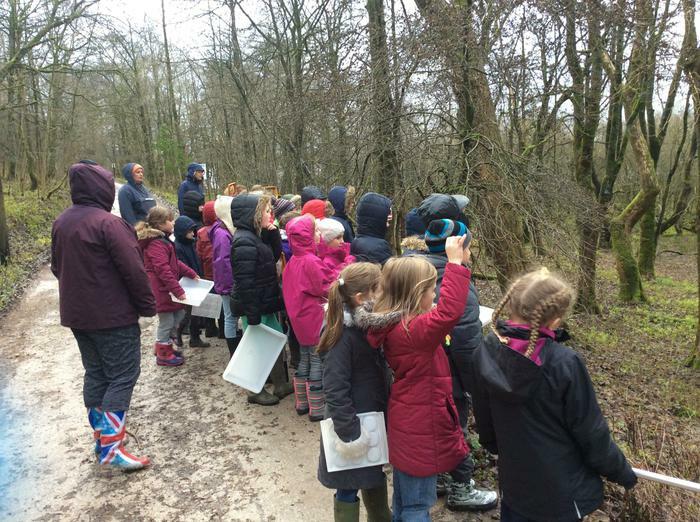 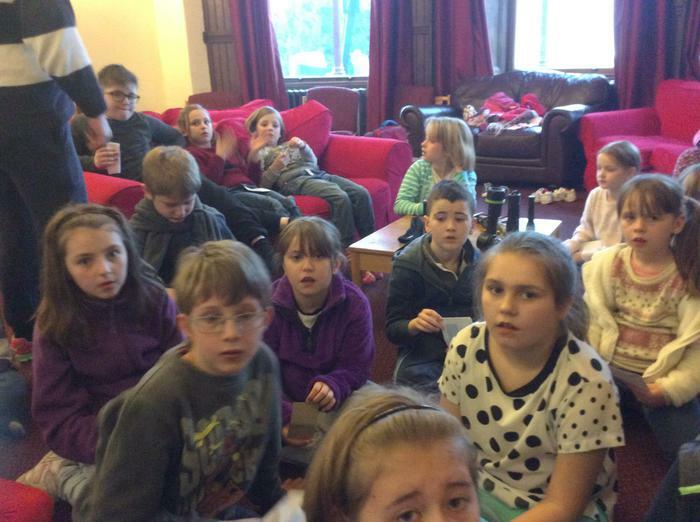 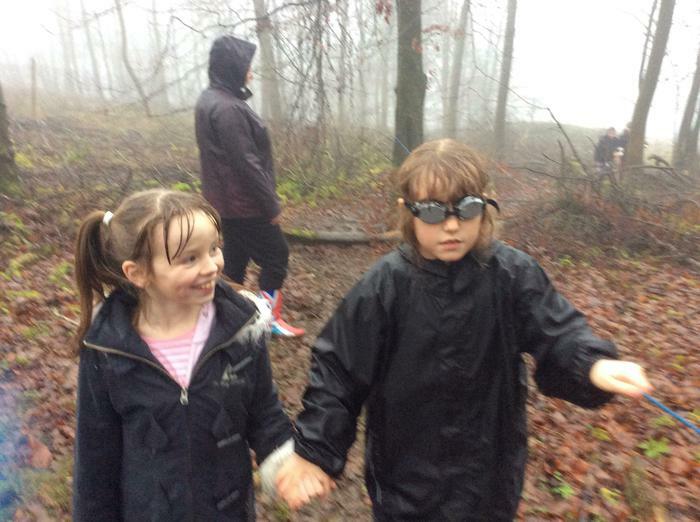 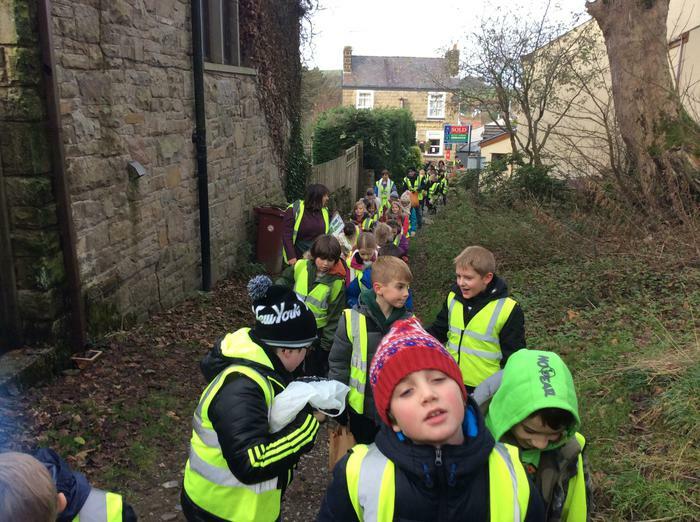 On Thursday 3rd December 2015, Year 4 went on an overnight trip to Malham Tarn in the Yorkshire Dales. 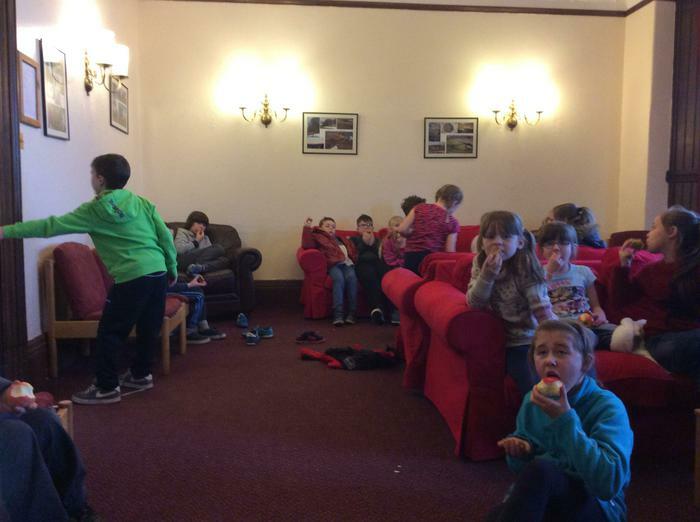 Check out below to see some of the pictures from our trip. 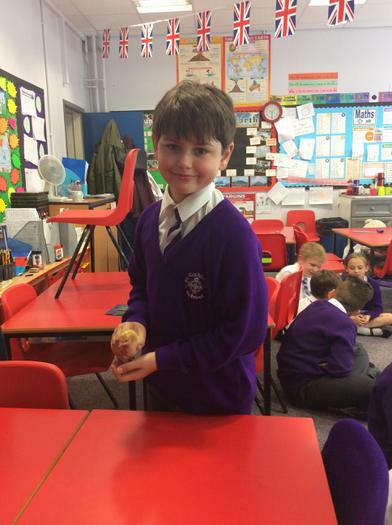 I know what a simile is and can use one to describe. 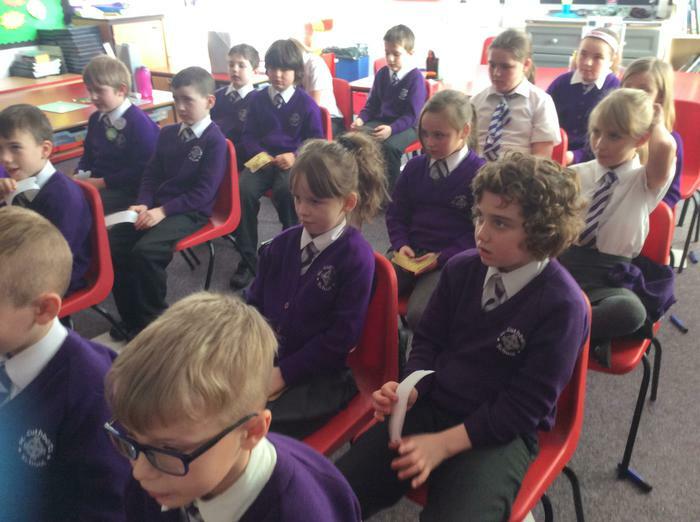 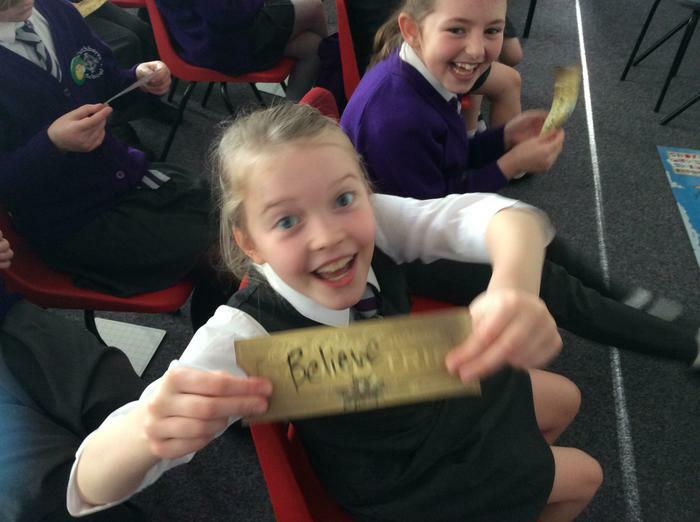 As part of our English story writing we spent some time aboard the Polar Express. 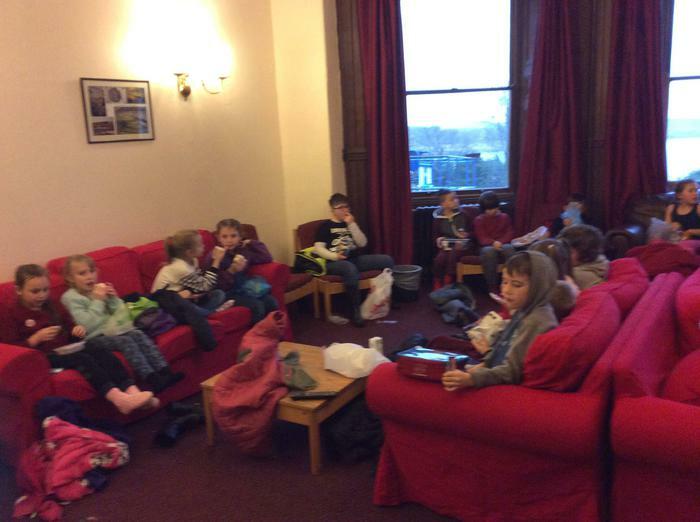 We talked about the journey and the magic on board as well as having hot chocolate and biscuits to keep us refreshed. 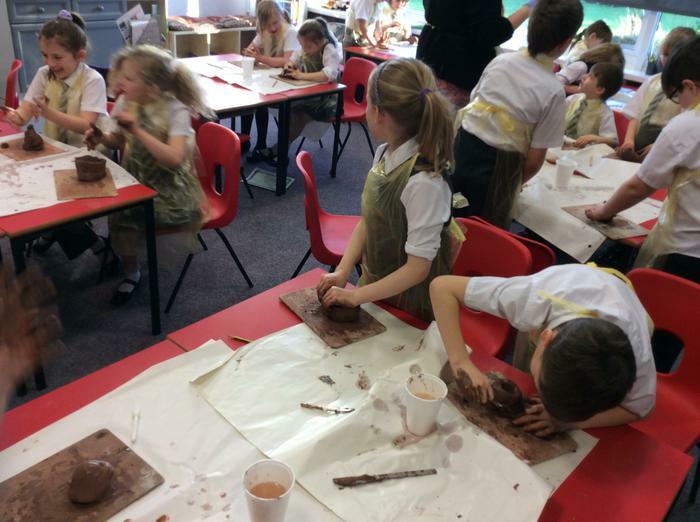 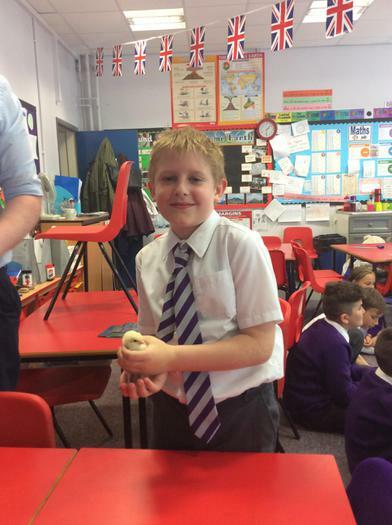 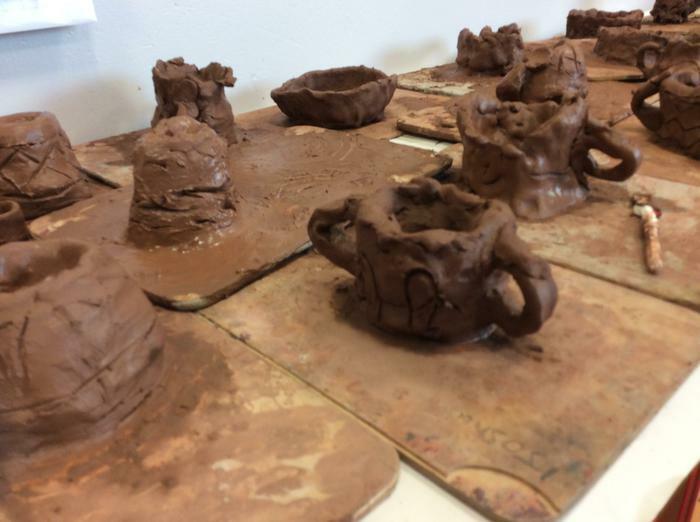 As part of our topic work on the Romans we have had a go at designing our own clay pots. 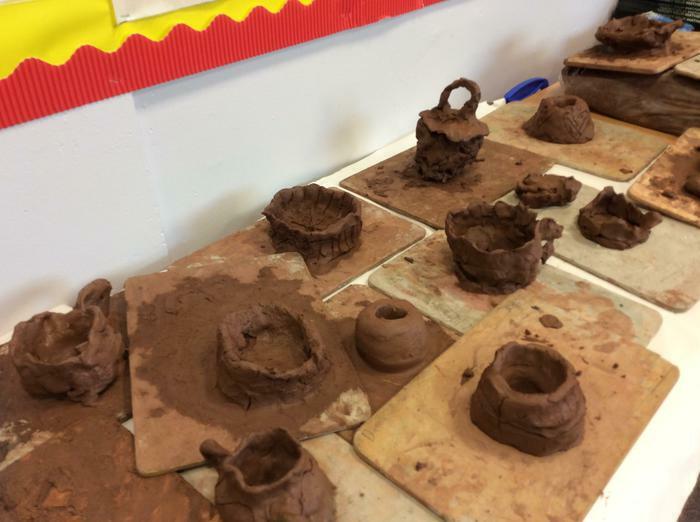 Clay pots were used for carrying lots of different supplies including oil, water and wine. 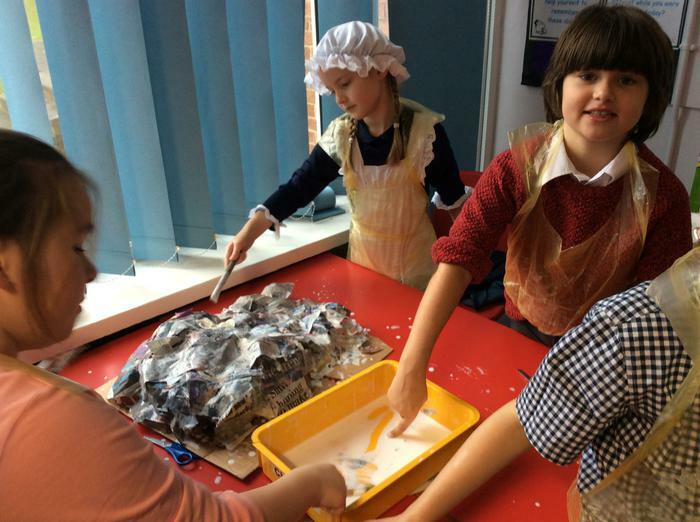 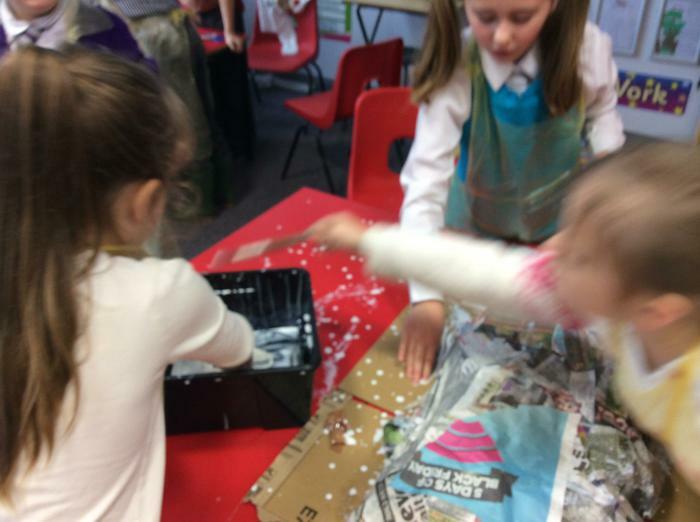 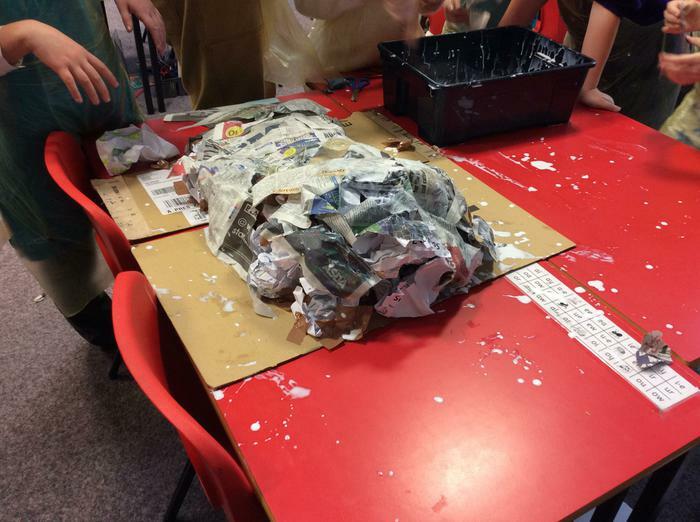 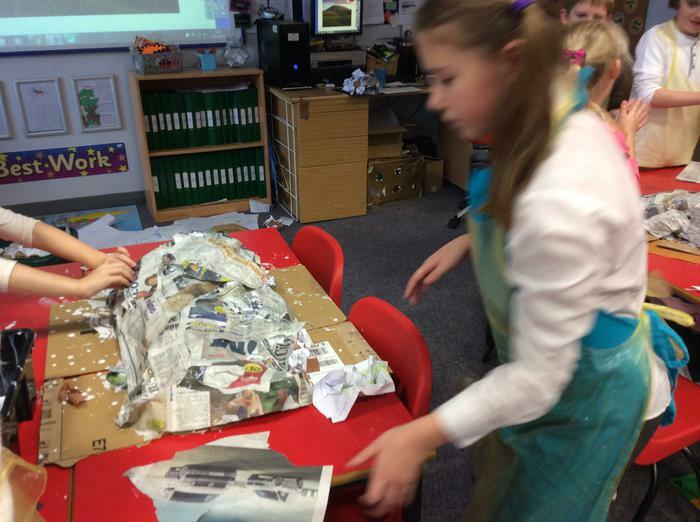 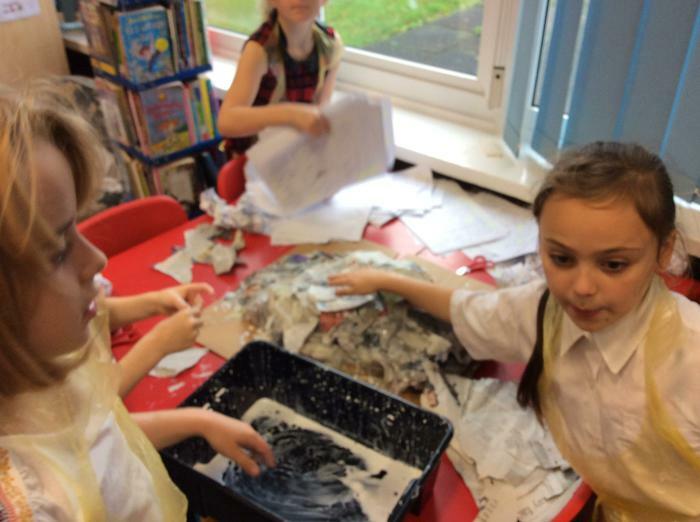 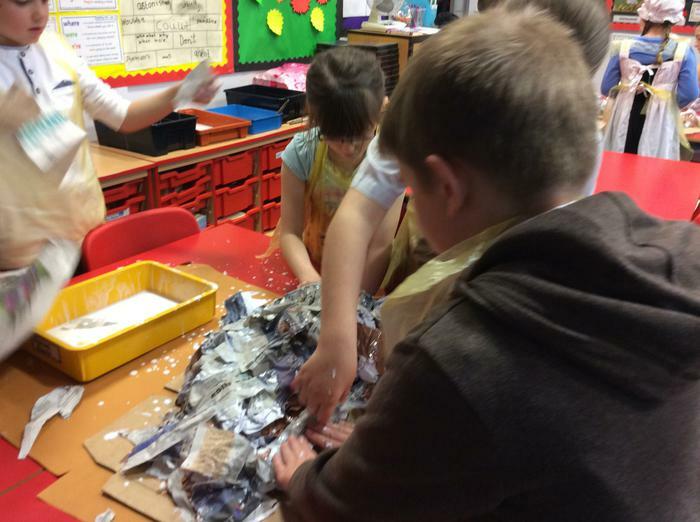 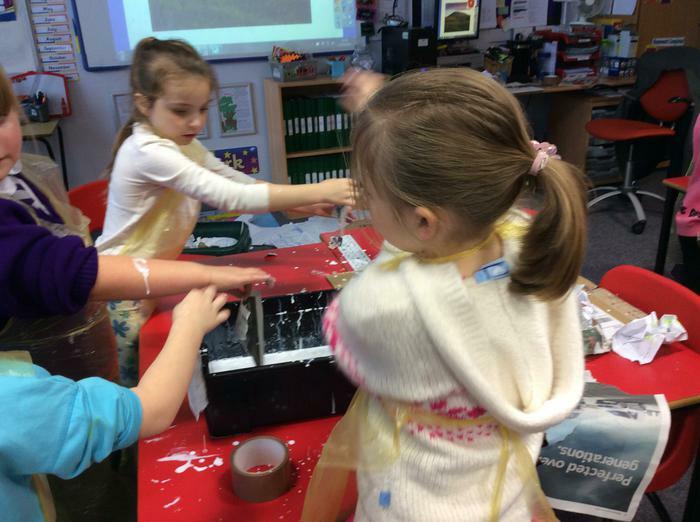 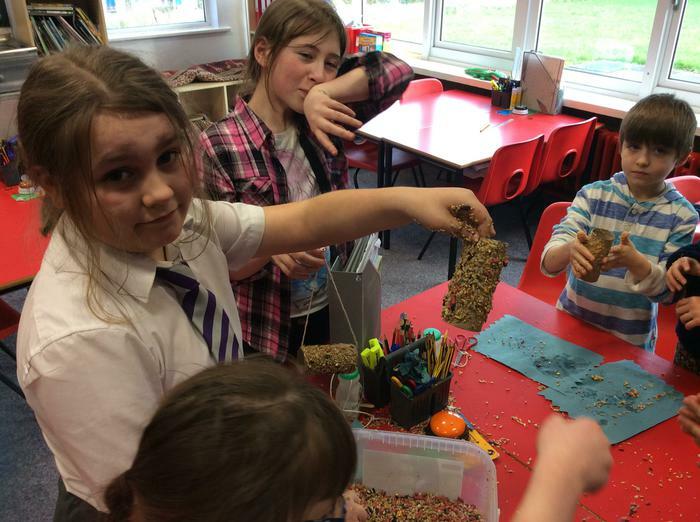 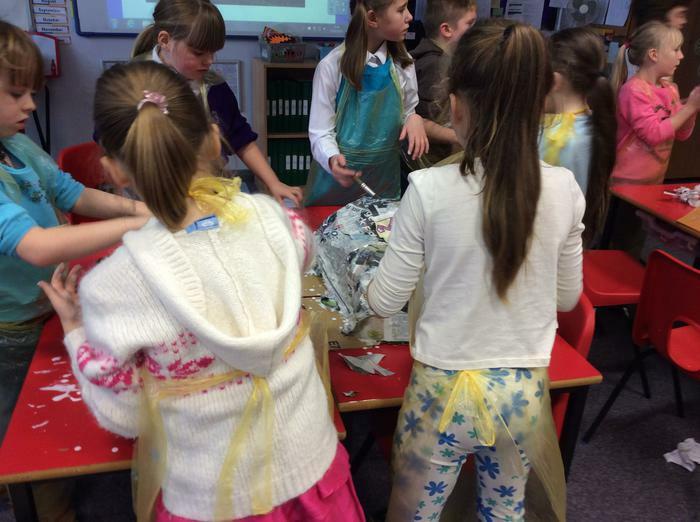 We enjoyed an afternoon of getting messy and creating our own masterpieces. 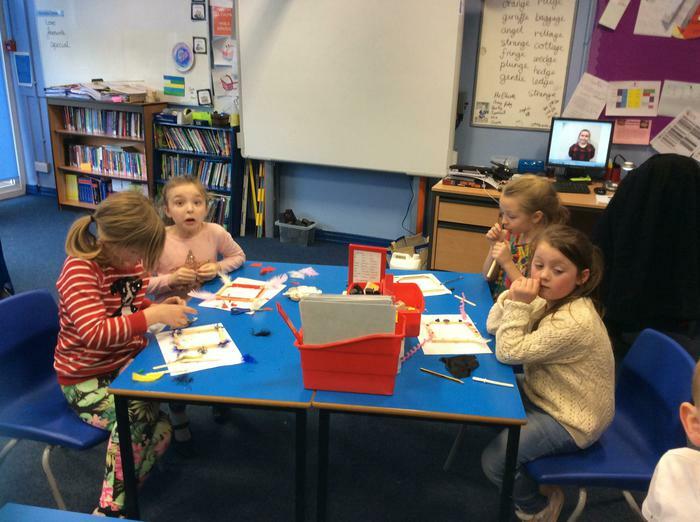 Our topic in science for this half term has been electrical circuits. 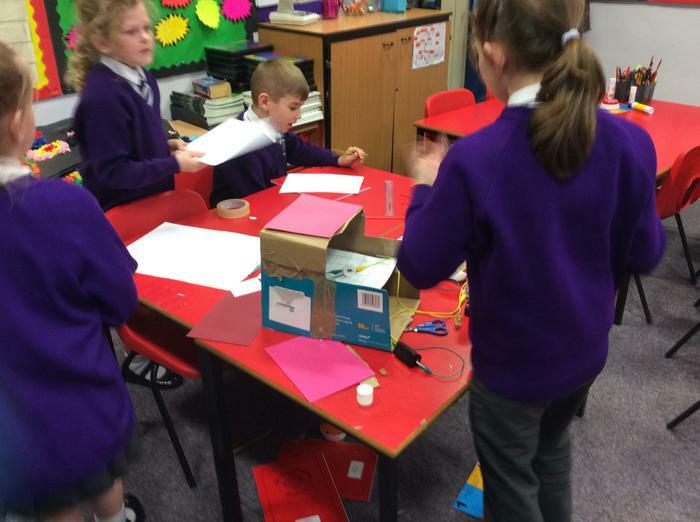 To finish our topic we completed a small project that involved designing a dolls house and fitting it with working lights in each room. 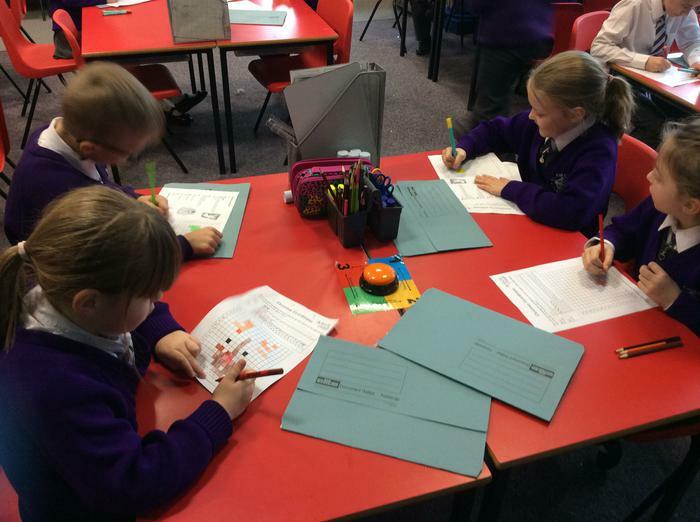 The children worked together to design the house and plan out the circuit. 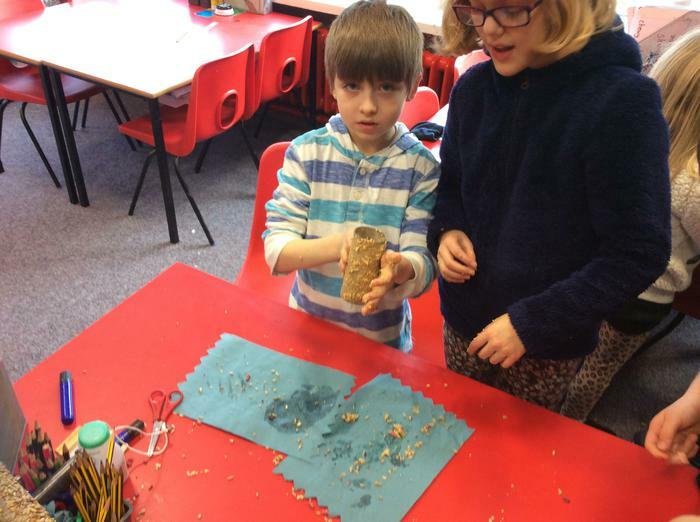 The final pieces were a great success. 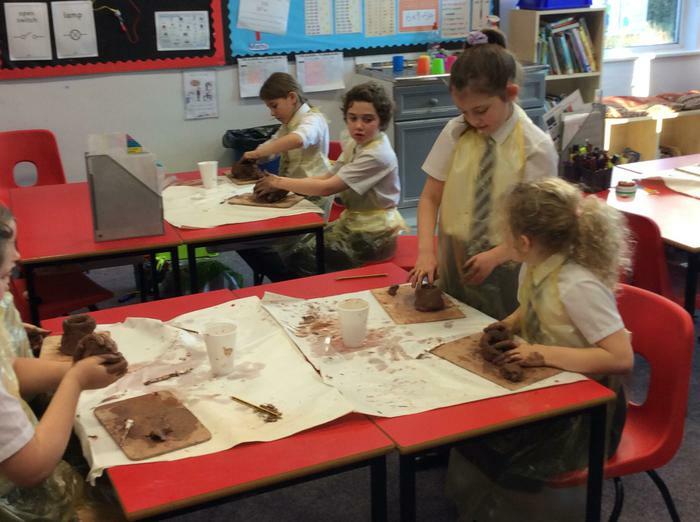 Today we had our third enrichment afternoon and it was great success. 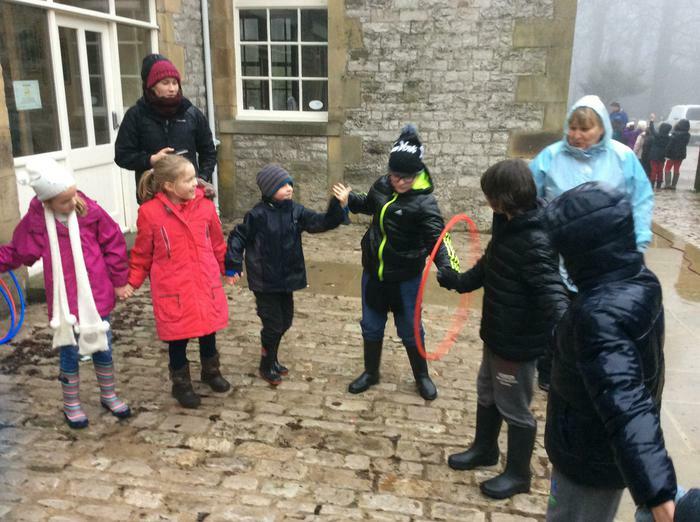 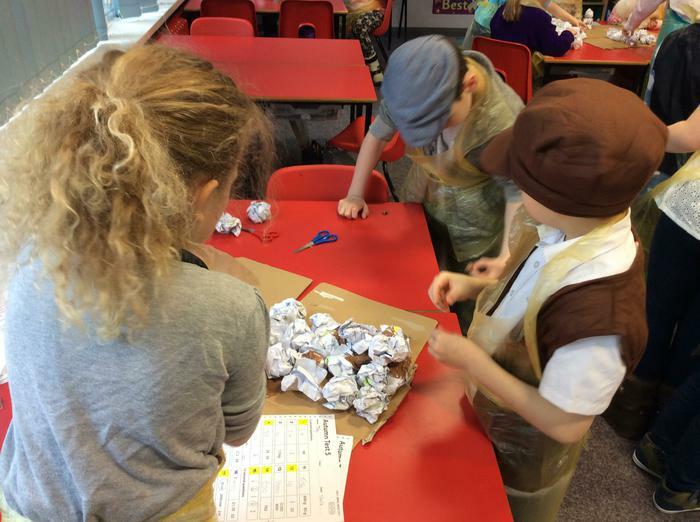 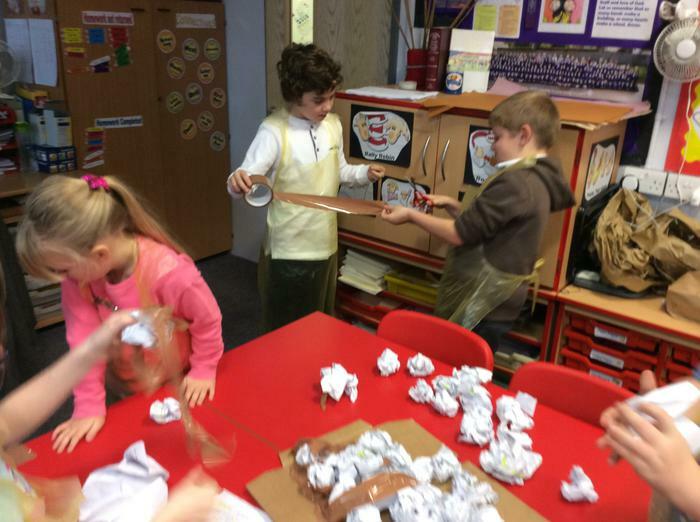 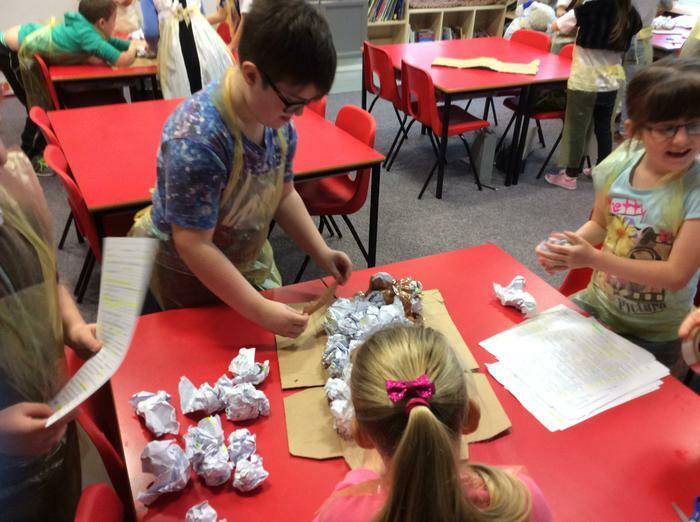 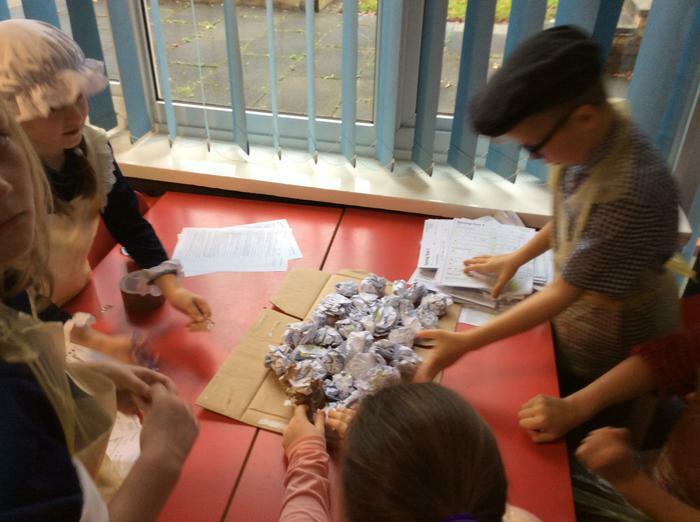 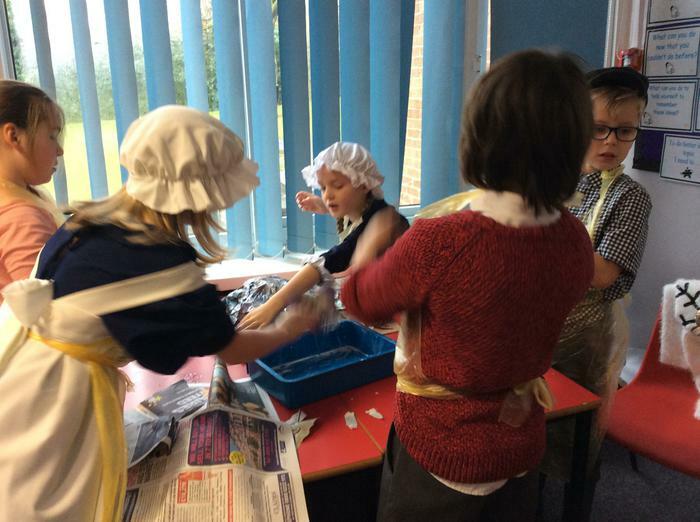 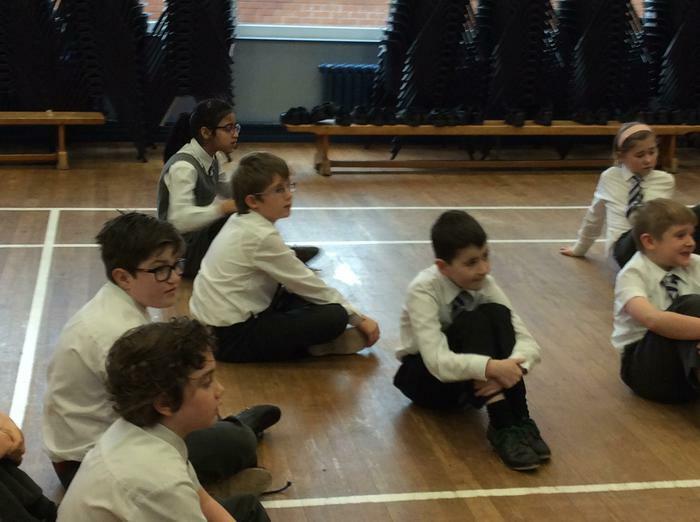 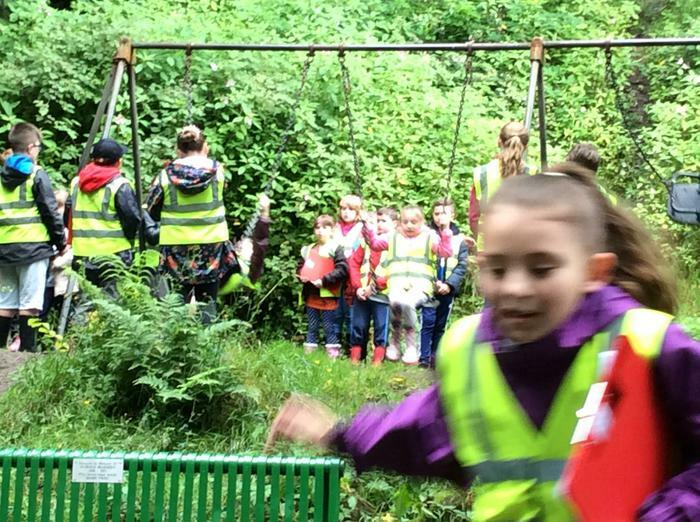 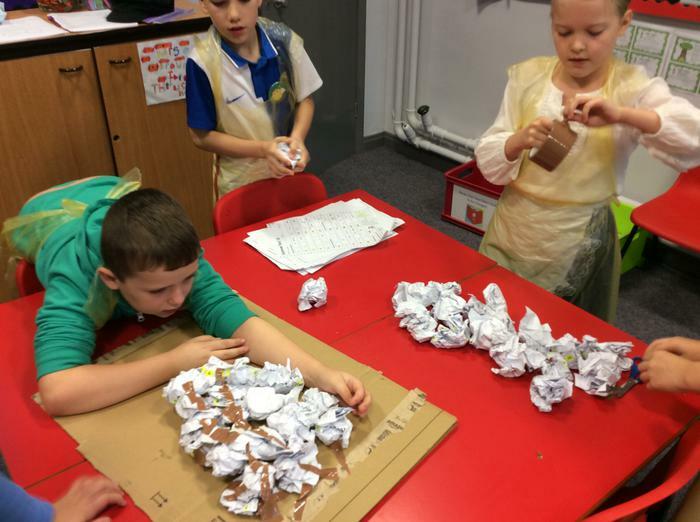 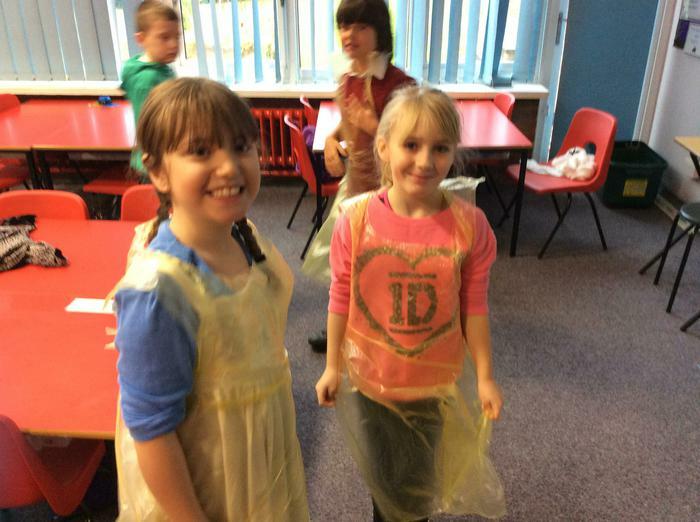 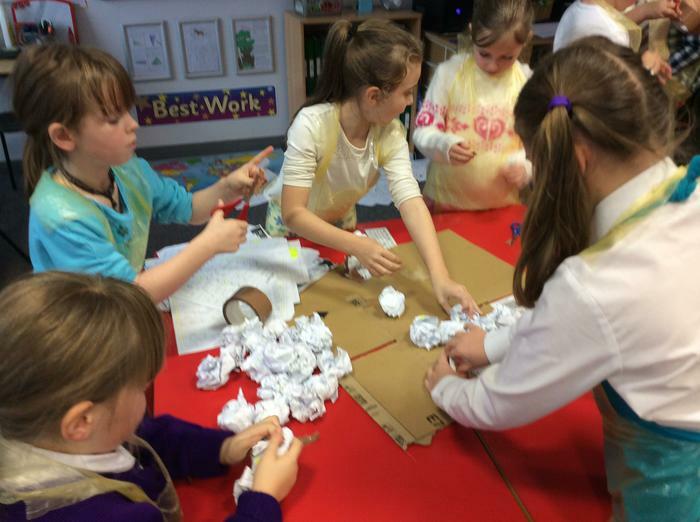 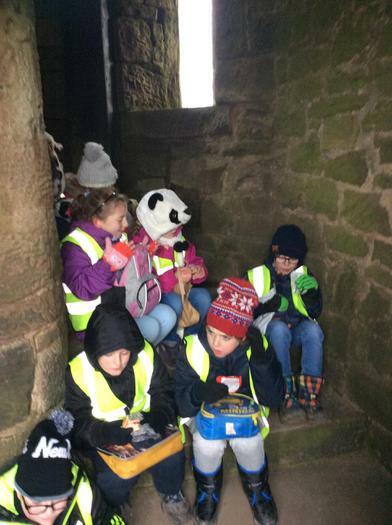 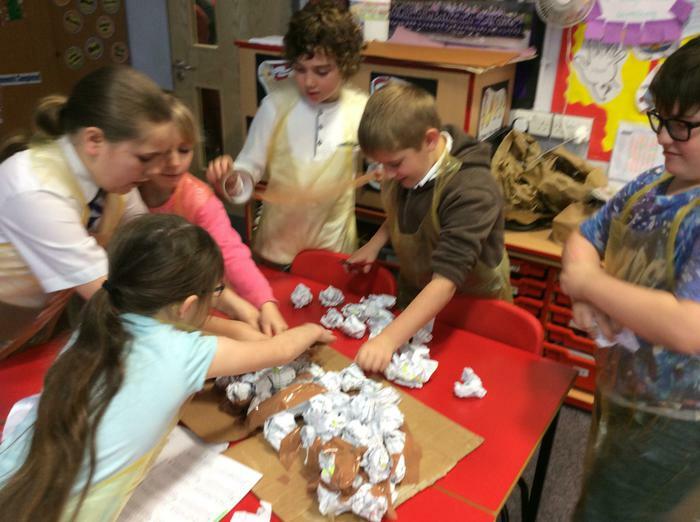 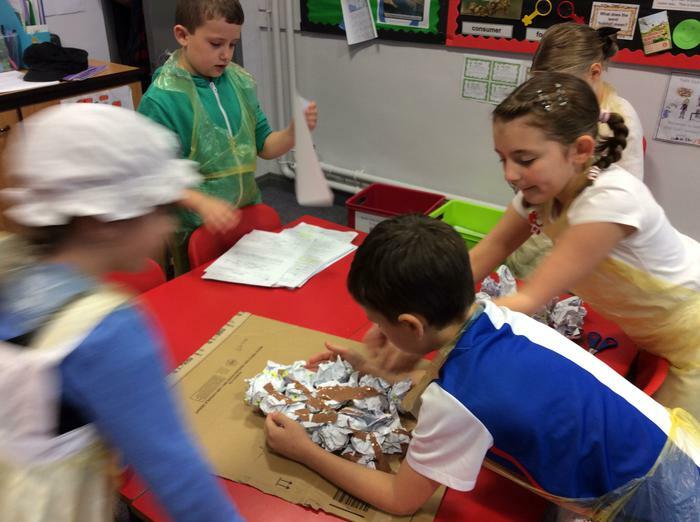 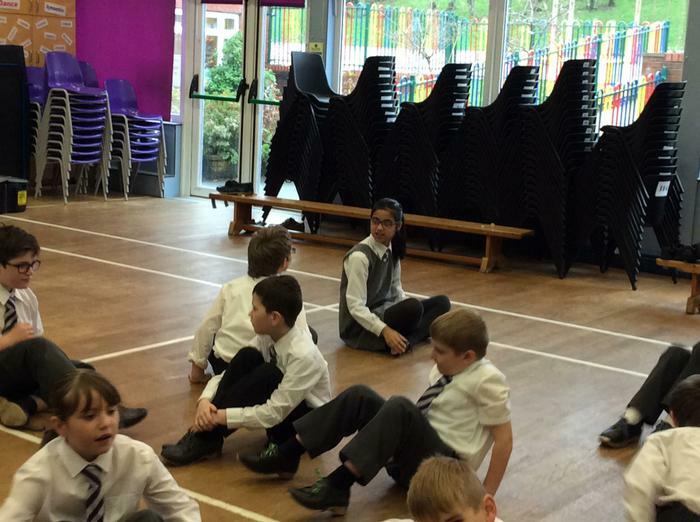 Children had the opportunity to select activities that they would otherwise not get time to take part in at school. 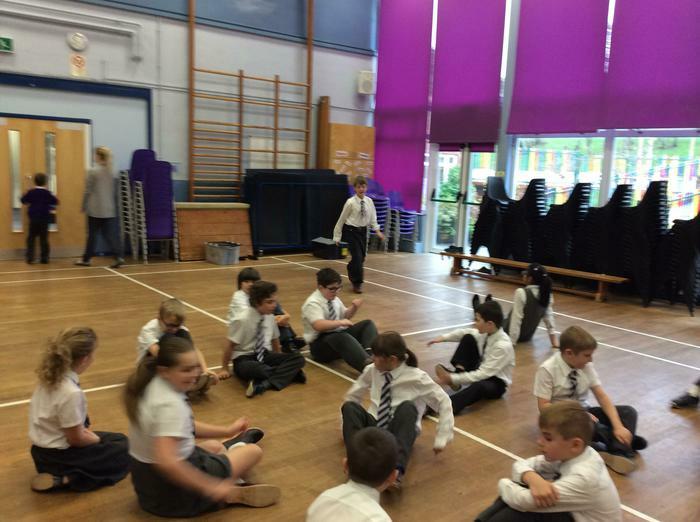 In KS2 we had an Olympics afternoon organised by two Y6 children, speed stacking, board games, art, eco club and RotaKids. 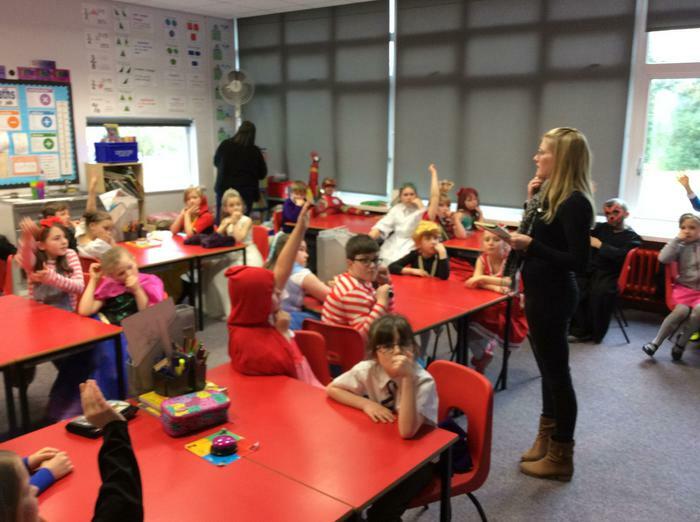 We celebrated another World Book Day in Year 4 by dressing up and spending time sharing the stories that we love. 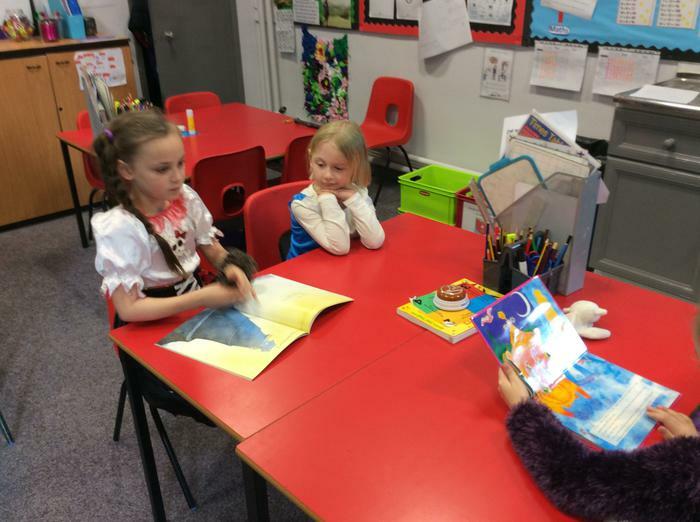 We invited the EYFS children over to our class and read stories to them and then for the last 15 minutes of the day Miss Covill came over to share one of her favourite stories, Esio Trot. 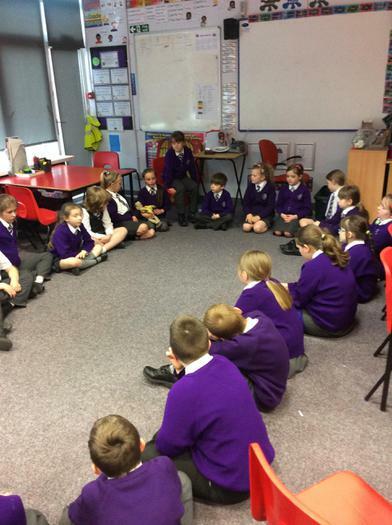 We had a circle time to talk about what the word trust means. 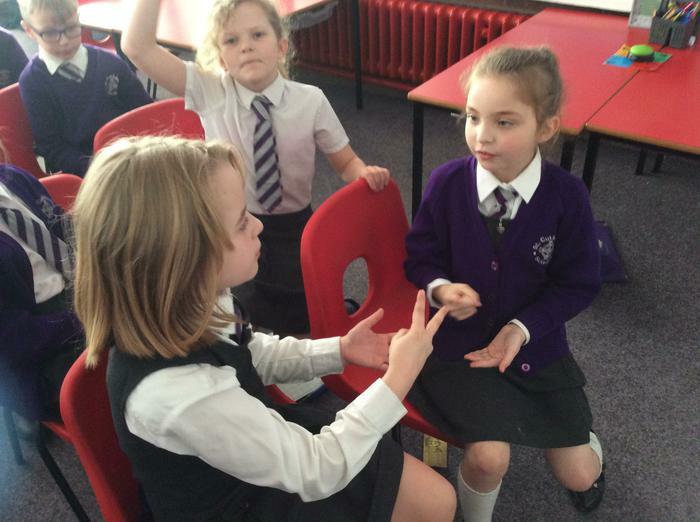 We spent time telling each other who we trusted and why. 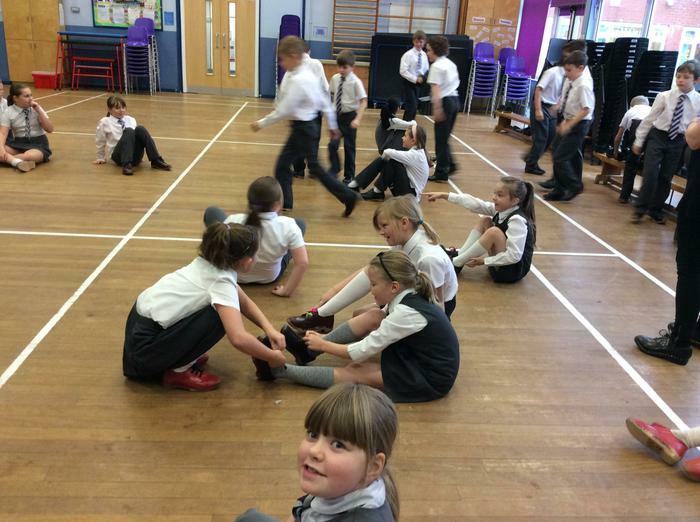 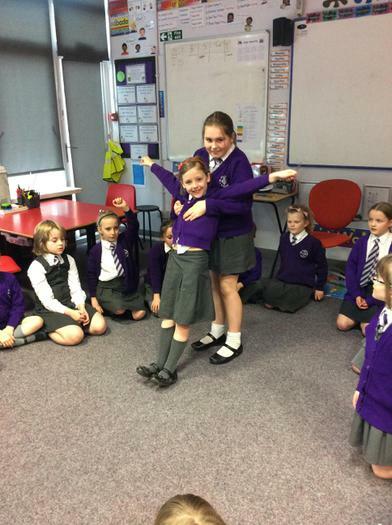 To finish we had a go at trusting each other by catching someone when they fell backwards. 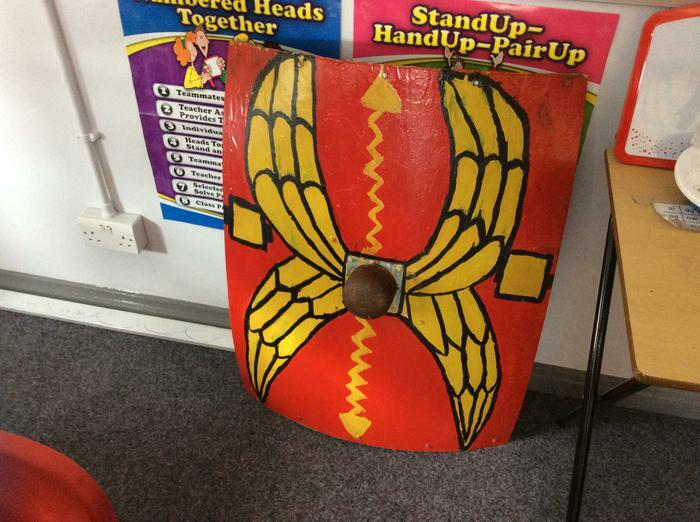 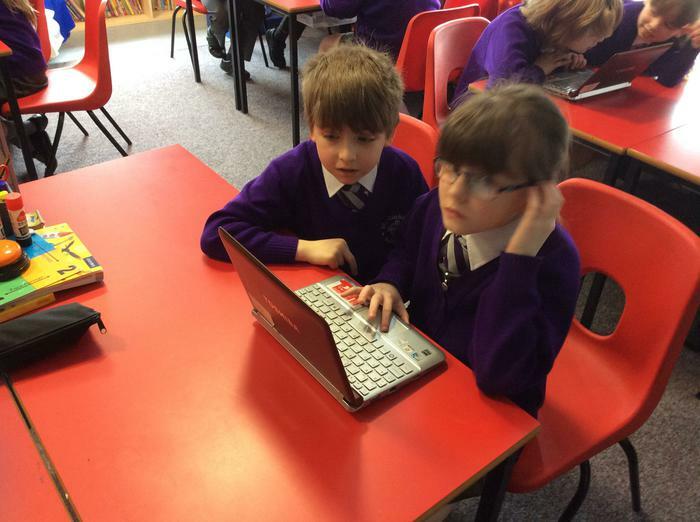 We have come to the end of an exciting term learning about 'The Romans' and to finish we had a go at creating our own Roman fact PowerPoints. 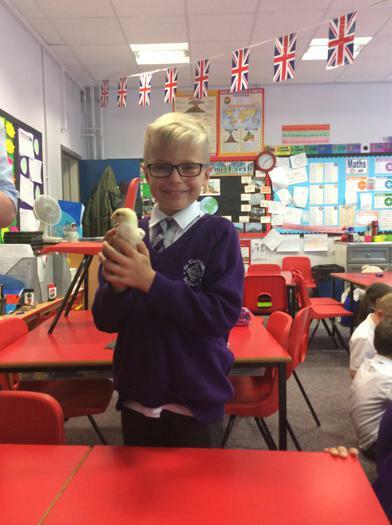 We presented these to the rest of the class and did a fantastic job. 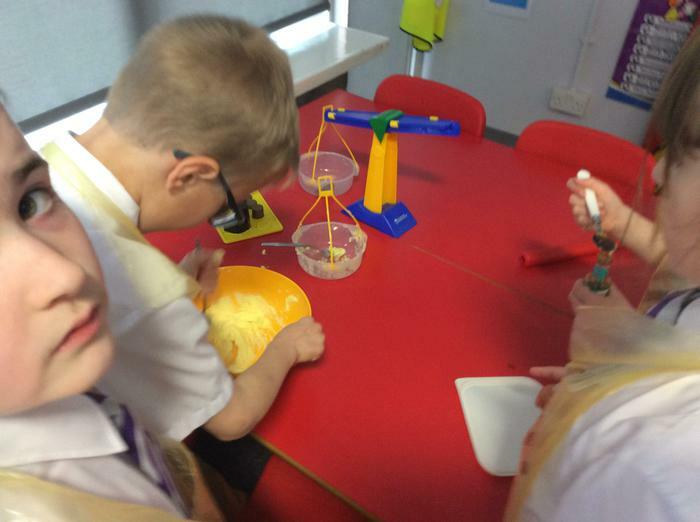 Using measure to help us bake. 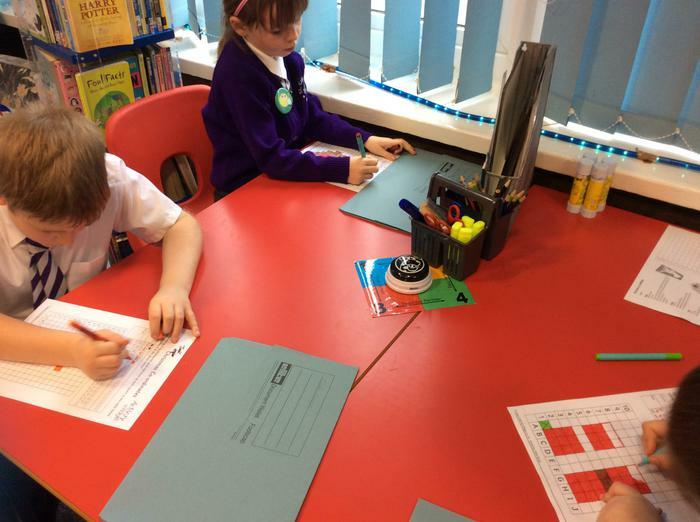 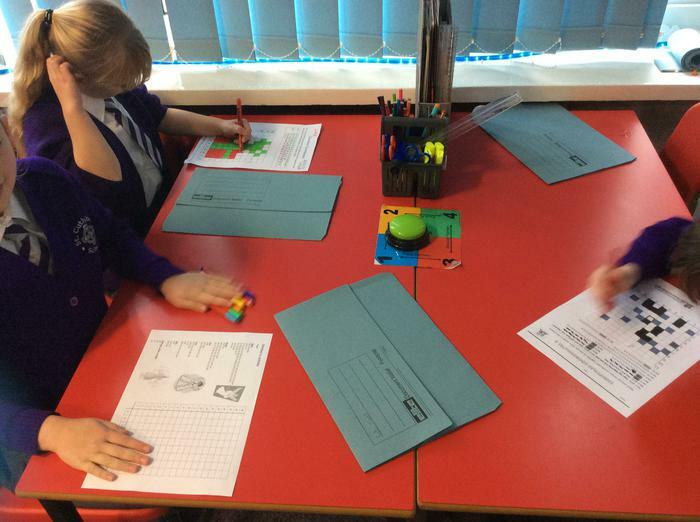 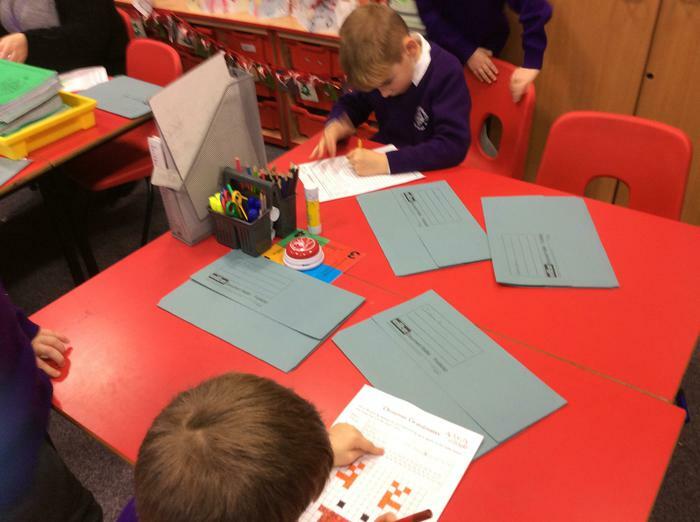 As part of our Maths work this week we have been looking at measuring in g and kg. 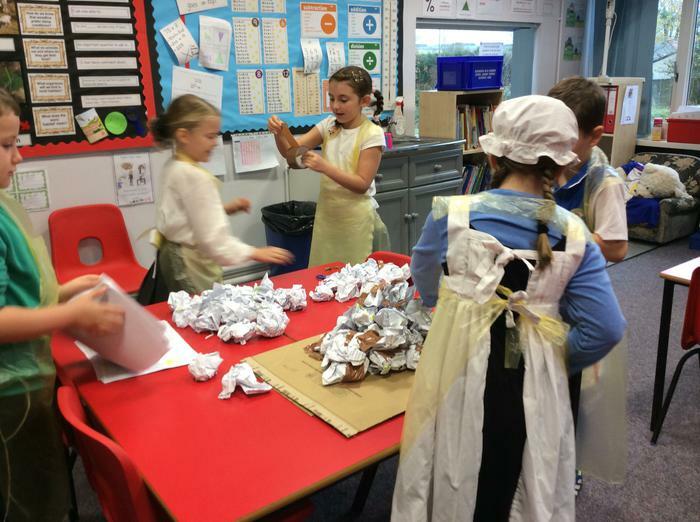 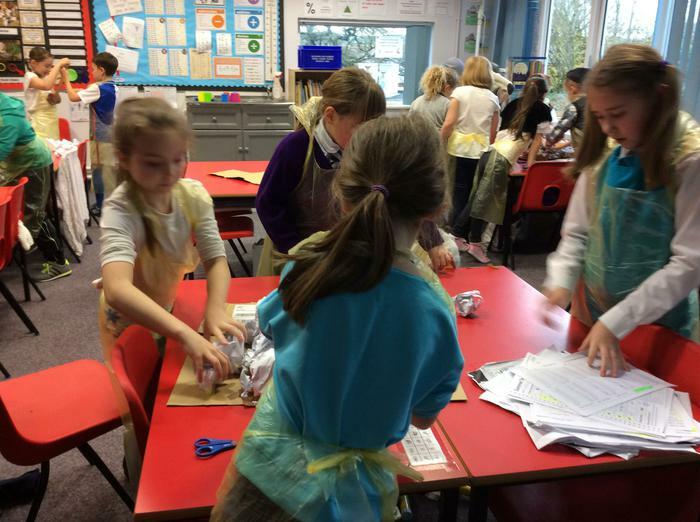 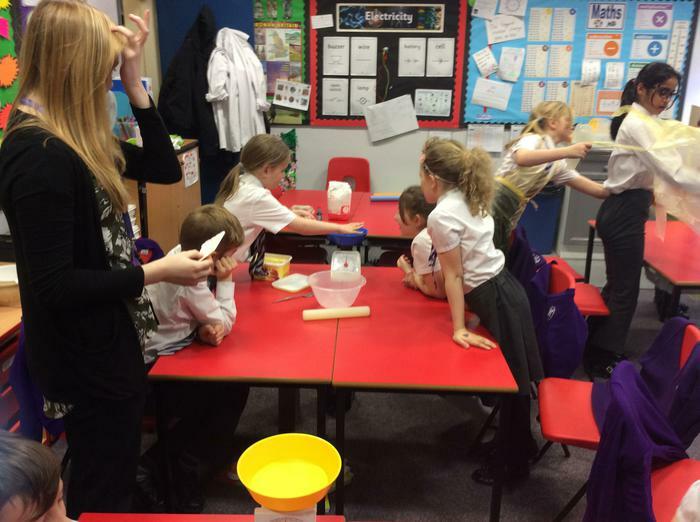 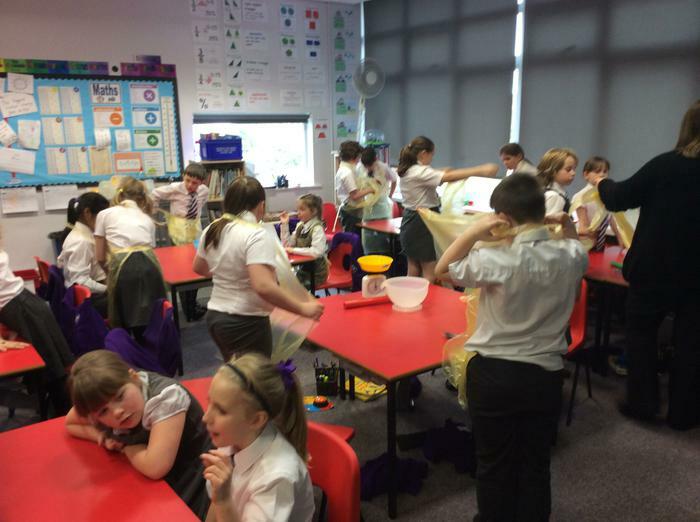 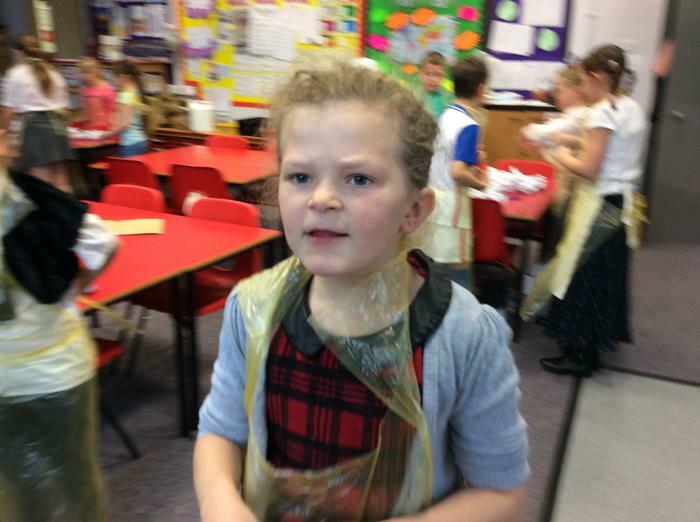 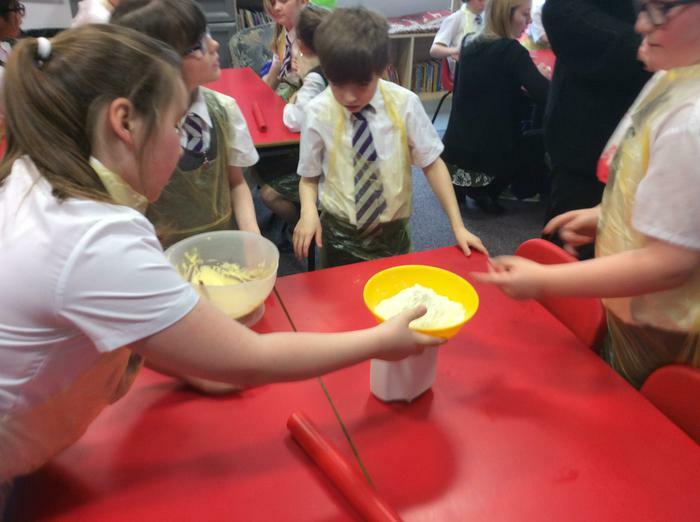 To help us apply all of the skills that we learnt we had a go at baking some biscuits. 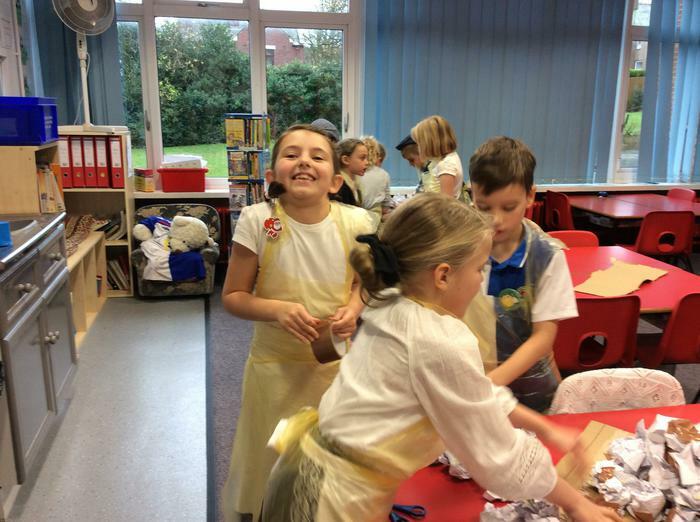 As it is St George's Day in a couple of weeks time, we decorated our biscuits with red and white icing. 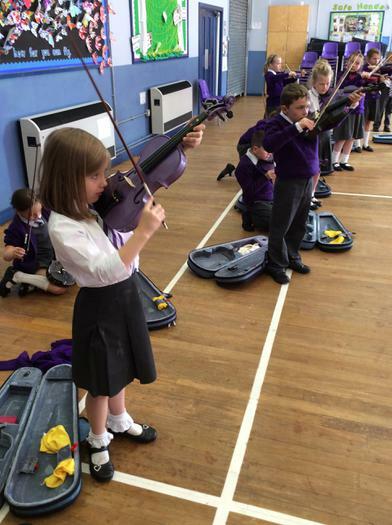 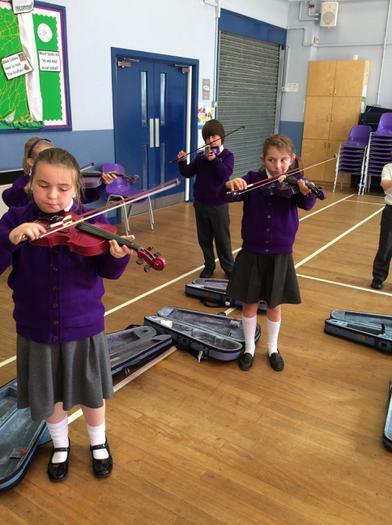 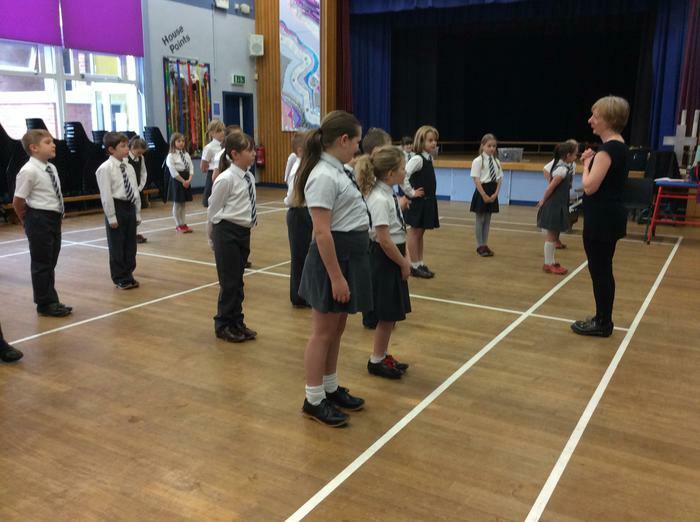 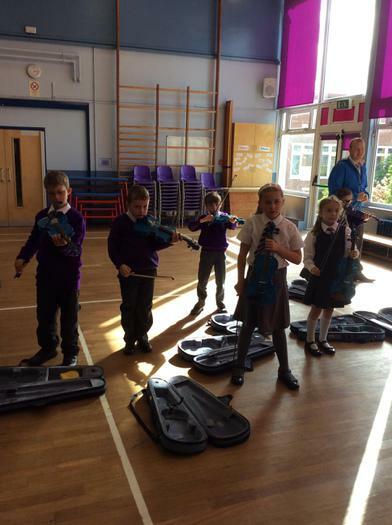 Today is our first music lesson of the Summer Term. 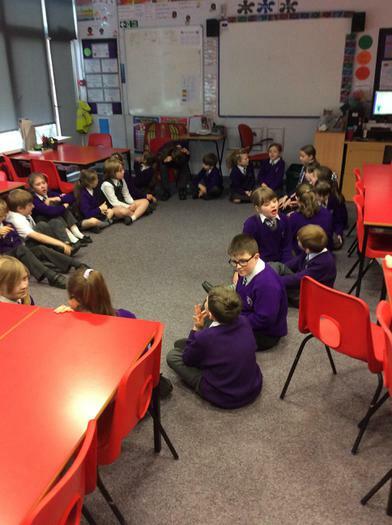 We will be learning how to sing in tune and looking at all of the things we can do with our voices. 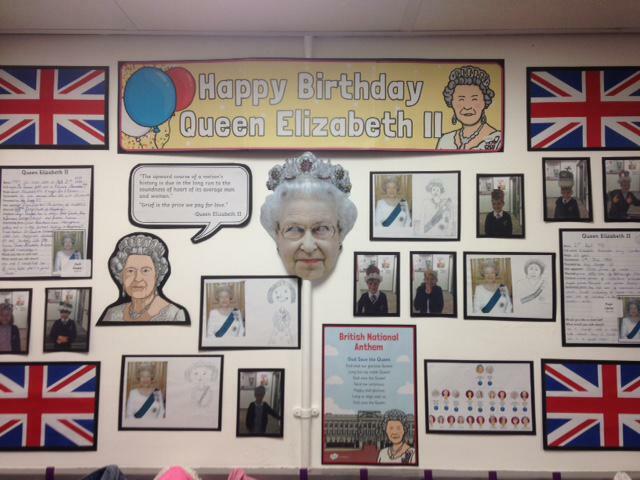 As part of the celebrations for the Queen's 90th birthday in Year 4 we have been doing lots of work based around her and her reign. 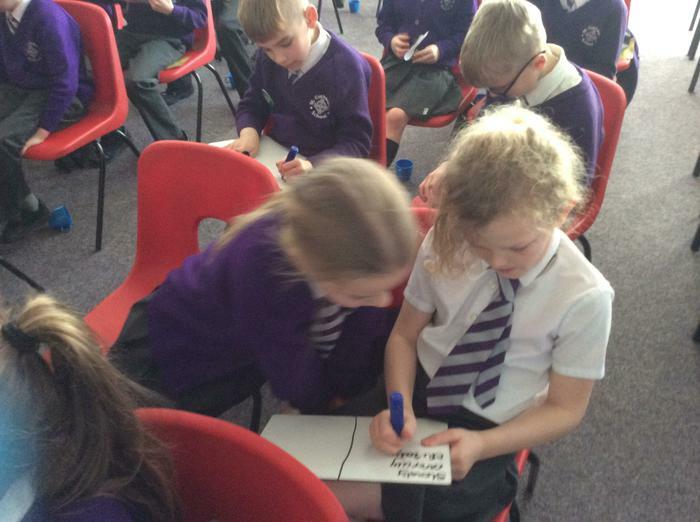 We looked at writing formal letters to congratulate her, we completed a fact file all about her and had a go at sketching a 90th birthday portrait. 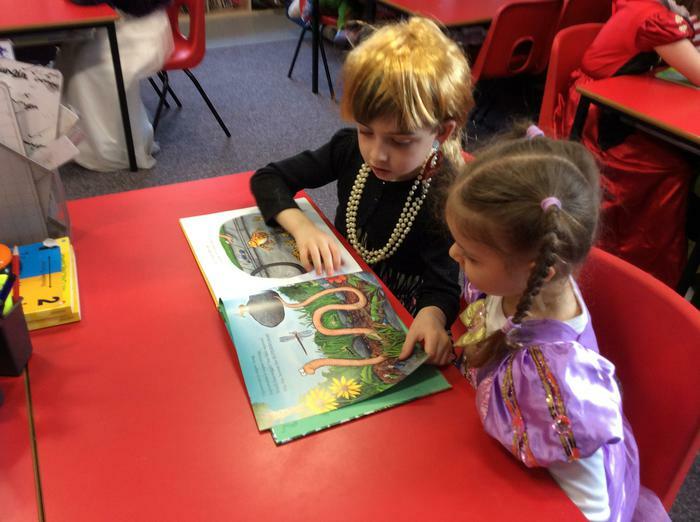 We also created crowns over the half term and our winners were James and Faye, well done to everyone who entered they looked great. 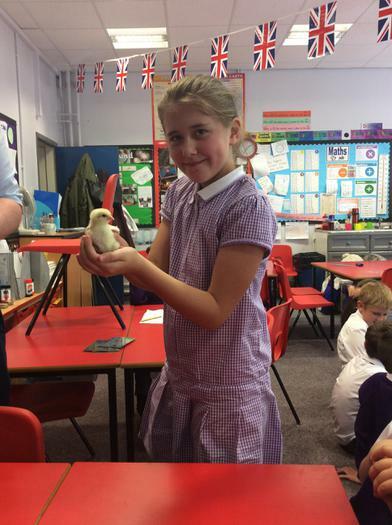 As part of our whole school writing theme we have had some special visitors in school. 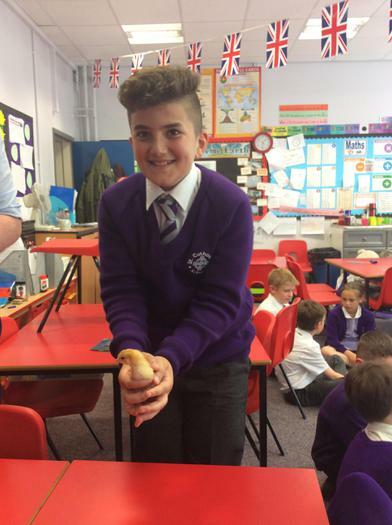 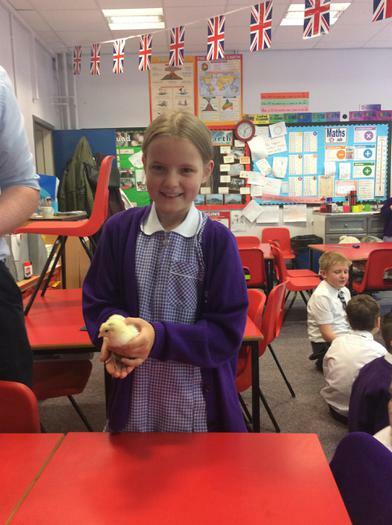 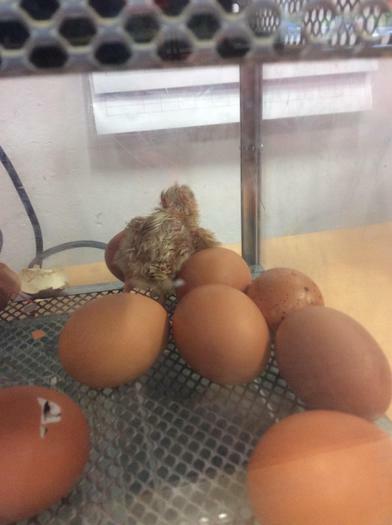 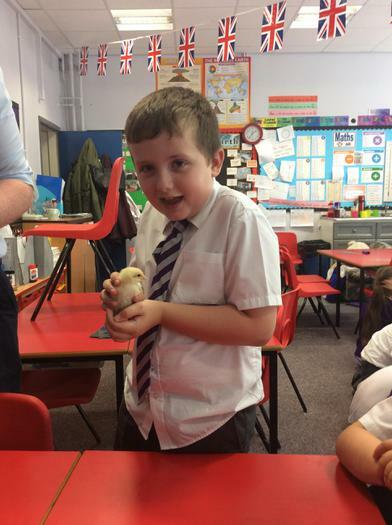 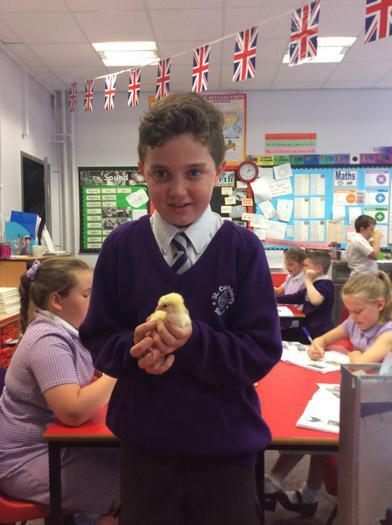 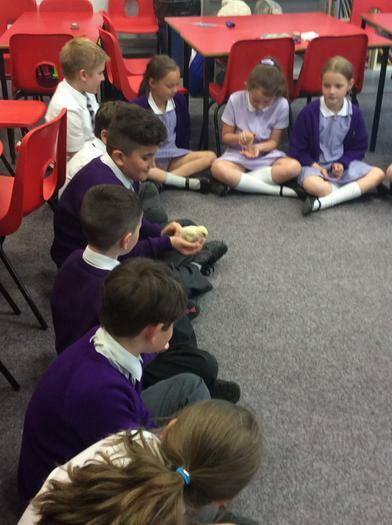 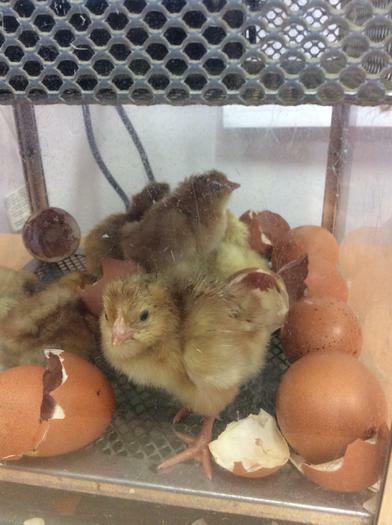 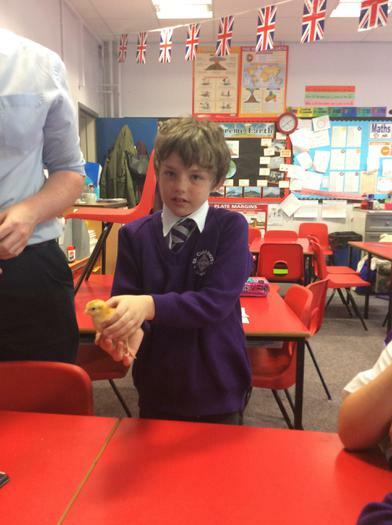 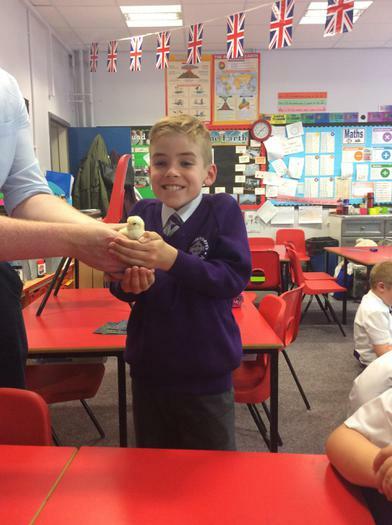 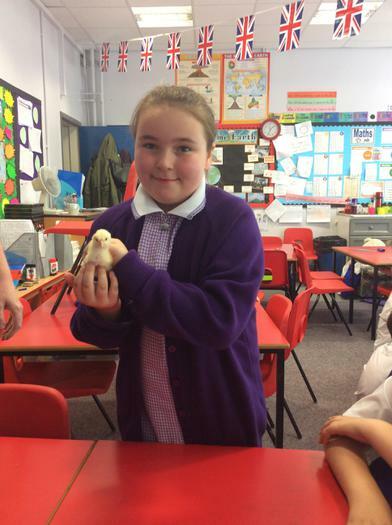 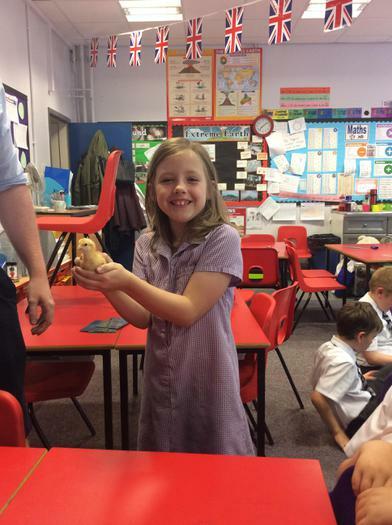 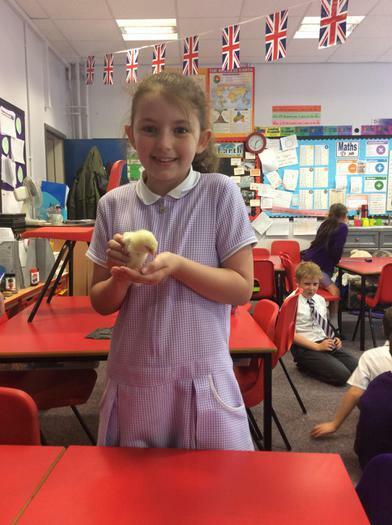 We were very lucky in Year 4 as we were chosen to look after the eggs until they hatched into chicks. 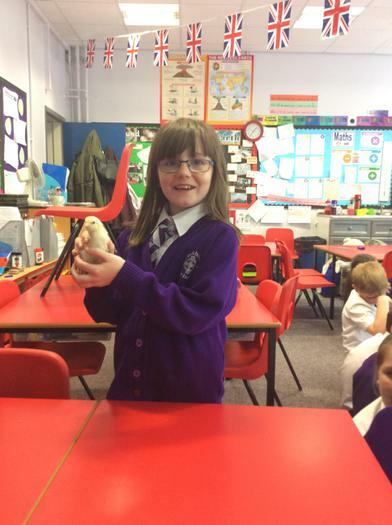 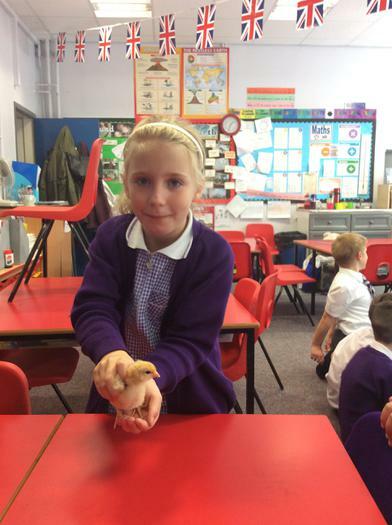 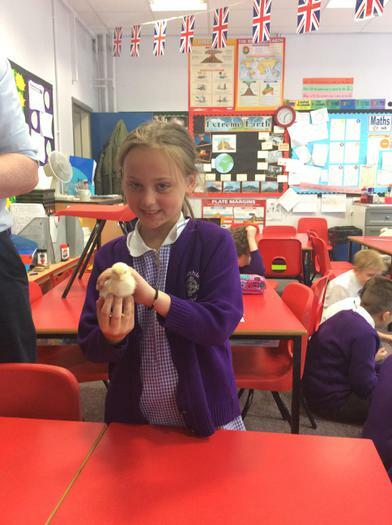 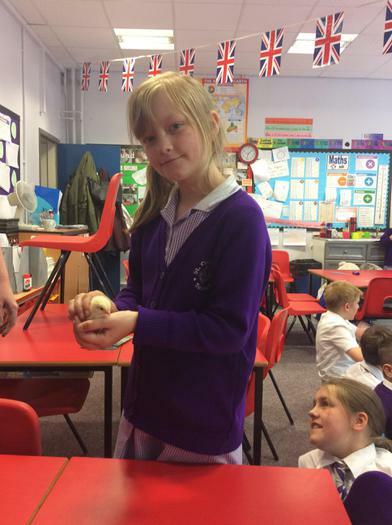 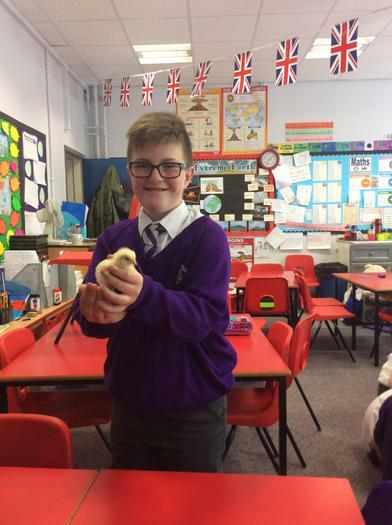 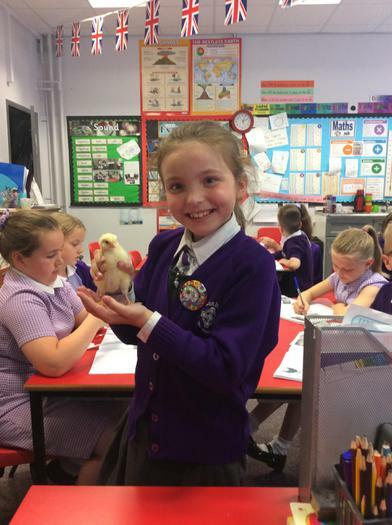 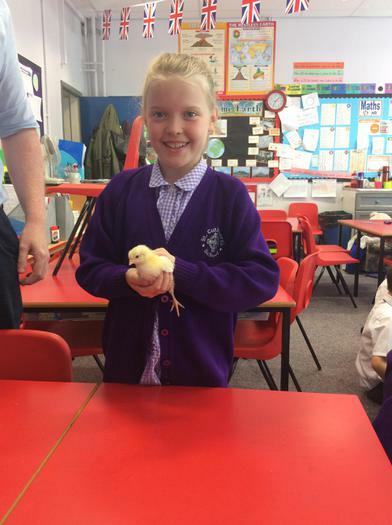 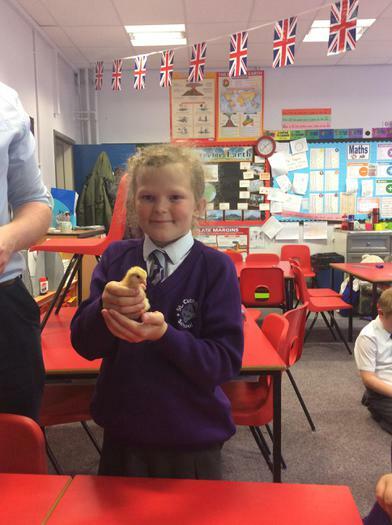 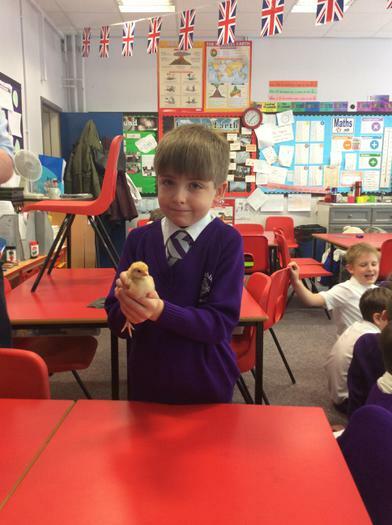 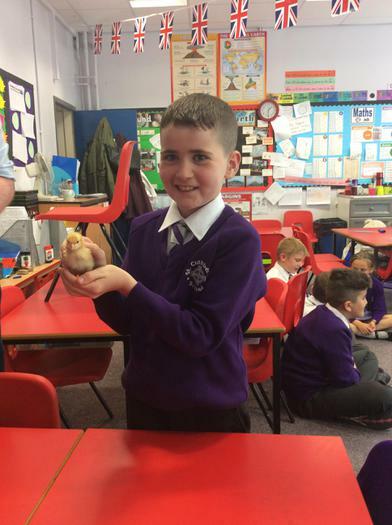 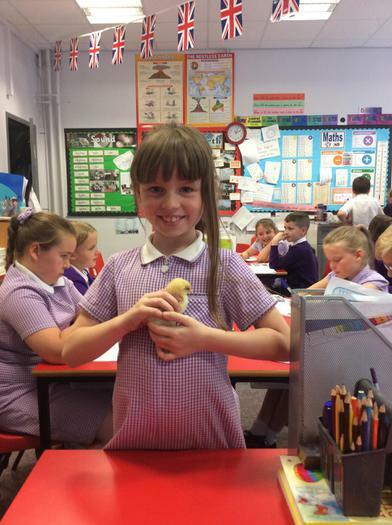 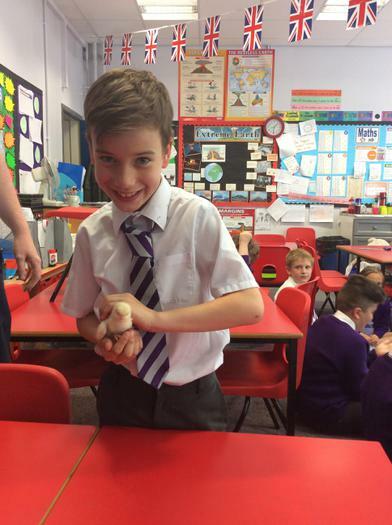 We enjoyed learning about the life cycle of a chicken and writing newspaper reports about their arrival at St Cuthbert's. 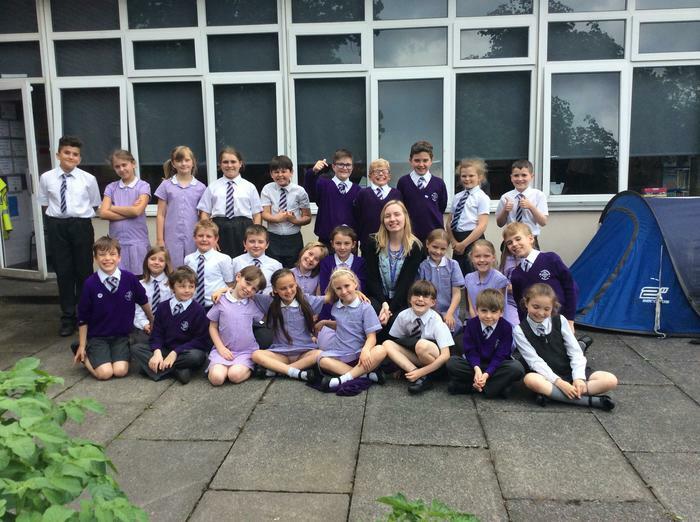 Today is Miss Austin's last day at St Cuthbert's. 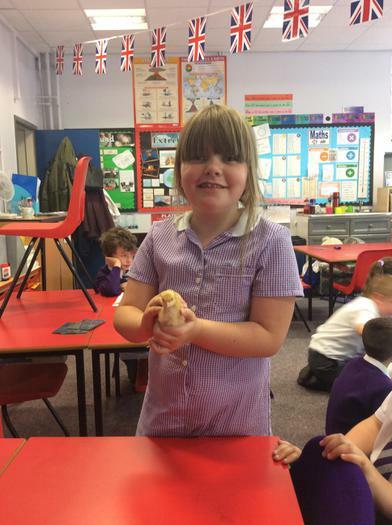 She has spent the last 4 weeks working in our class and has taught many fun and interesting lessons. 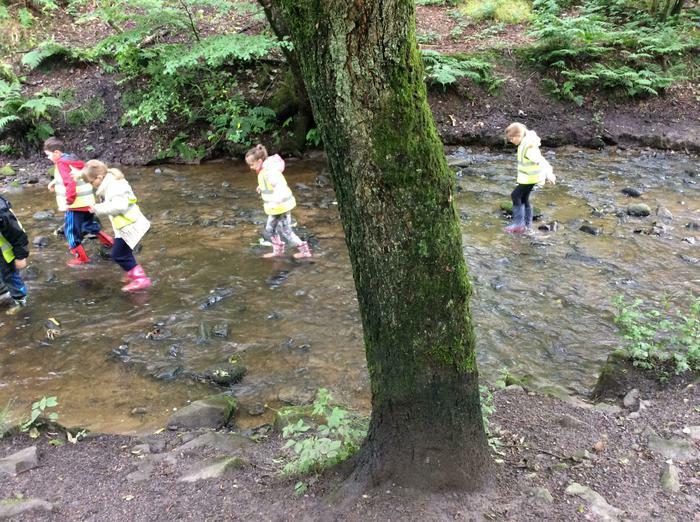 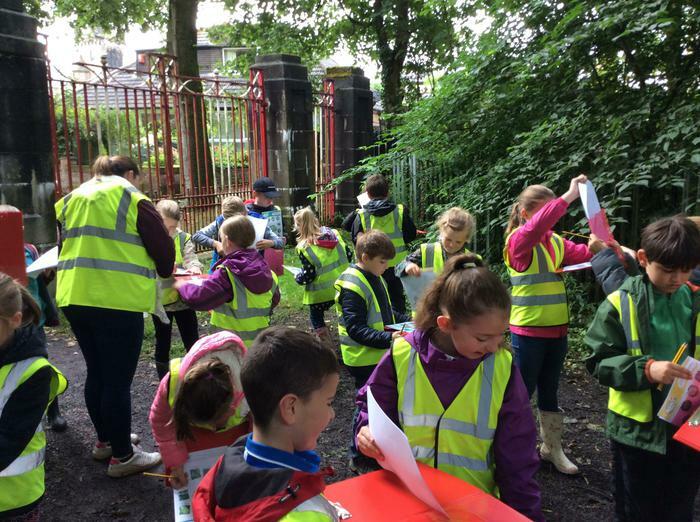 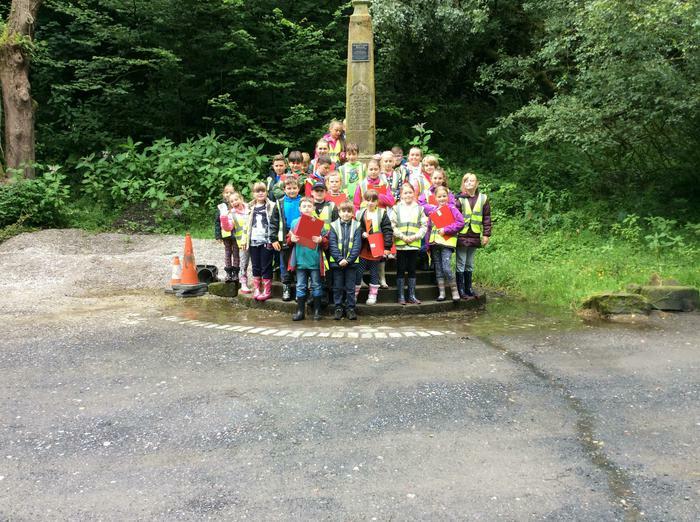 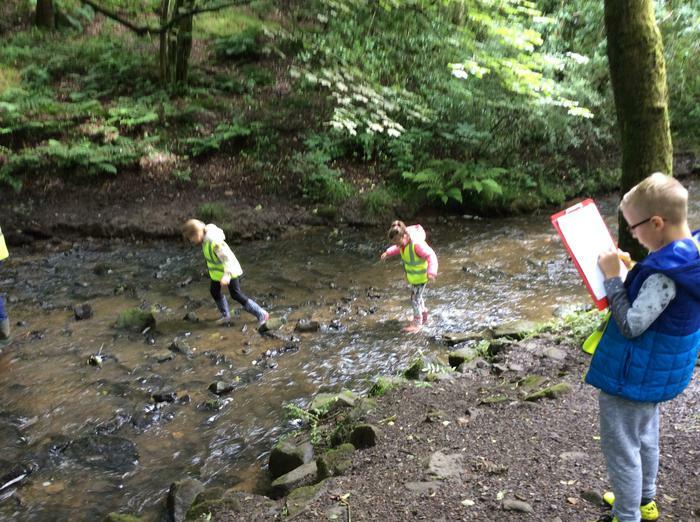 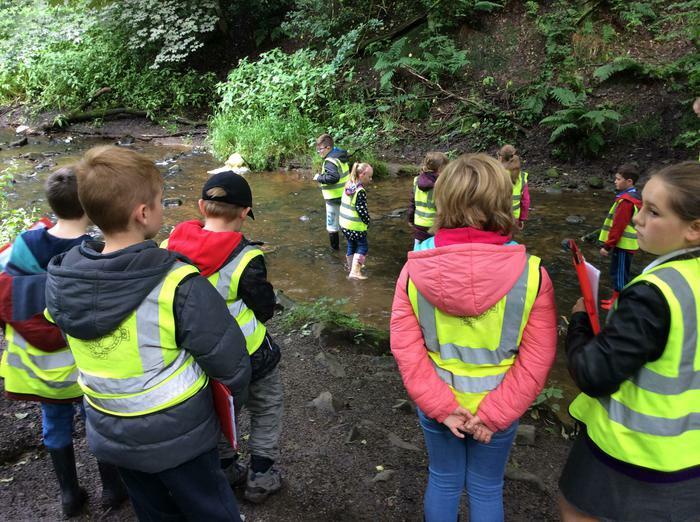 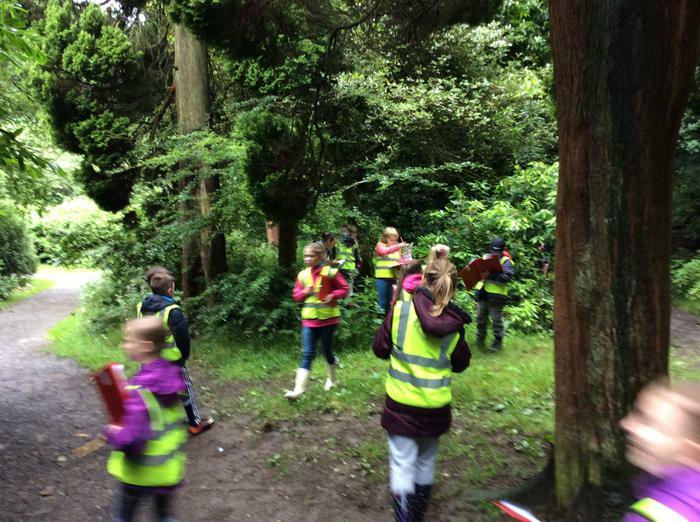 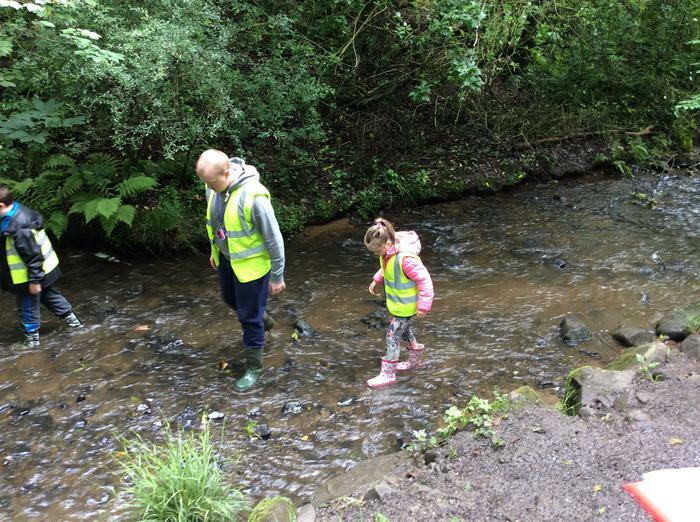 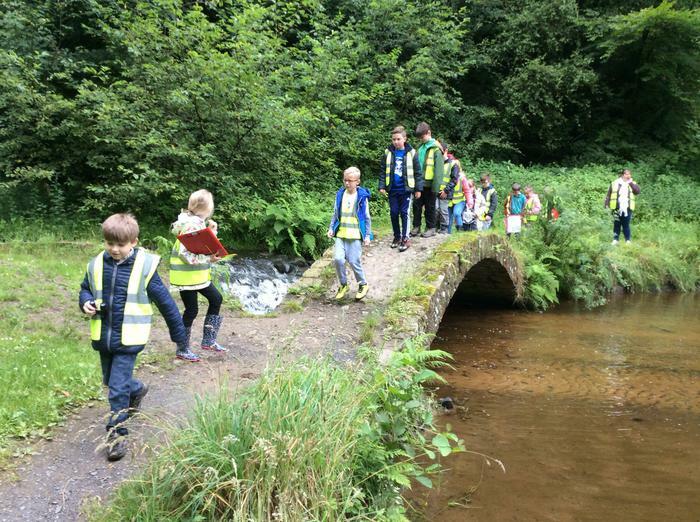 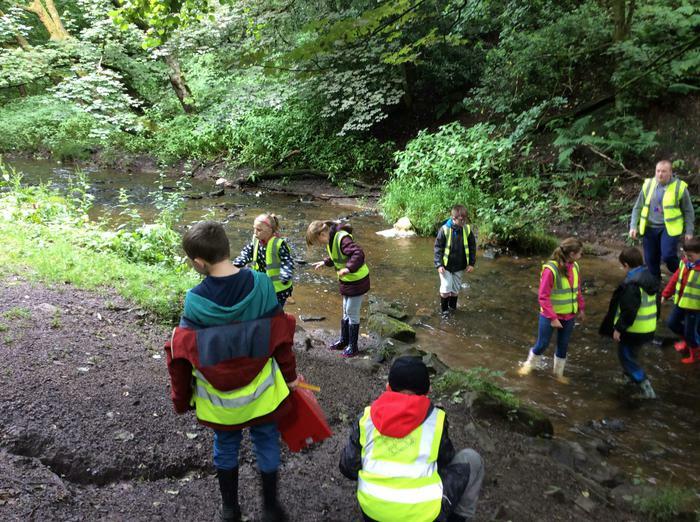 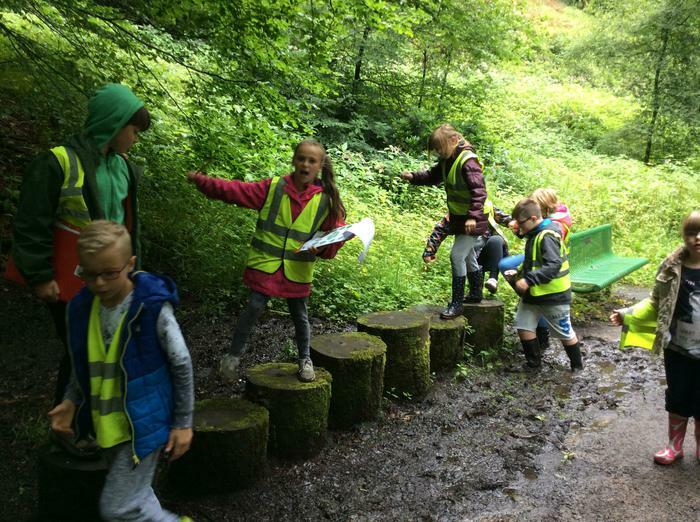 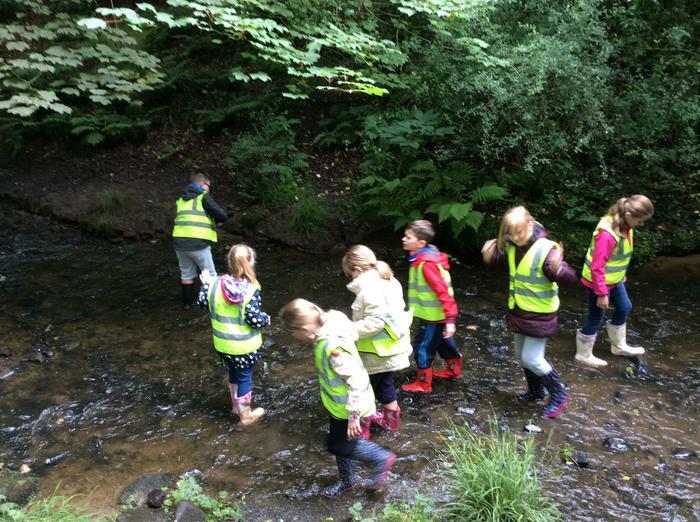 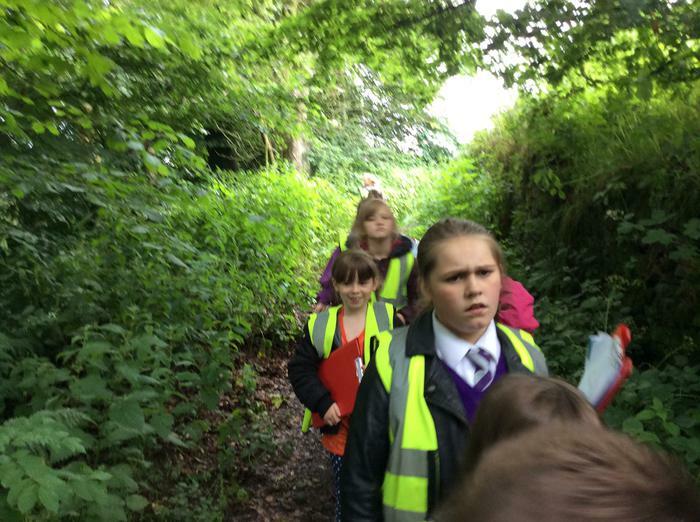 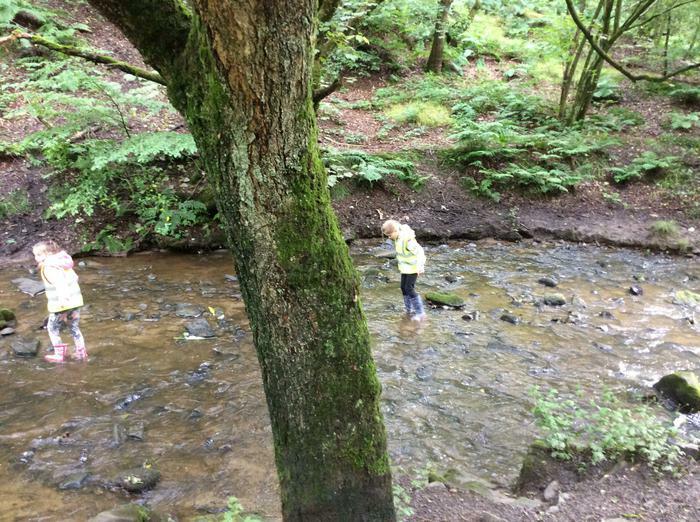 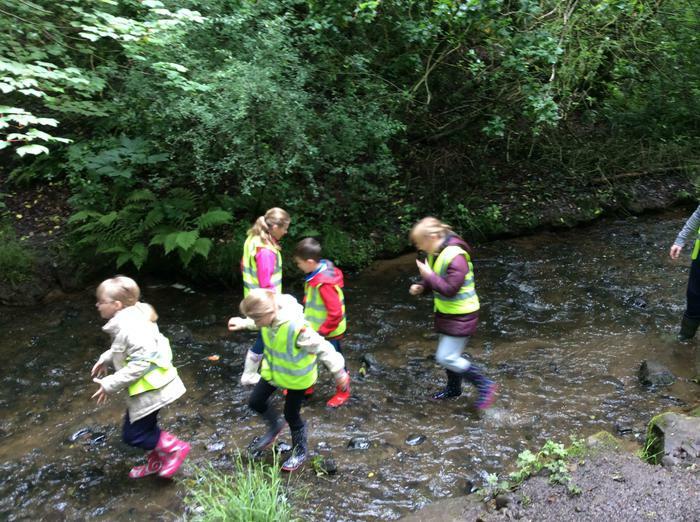 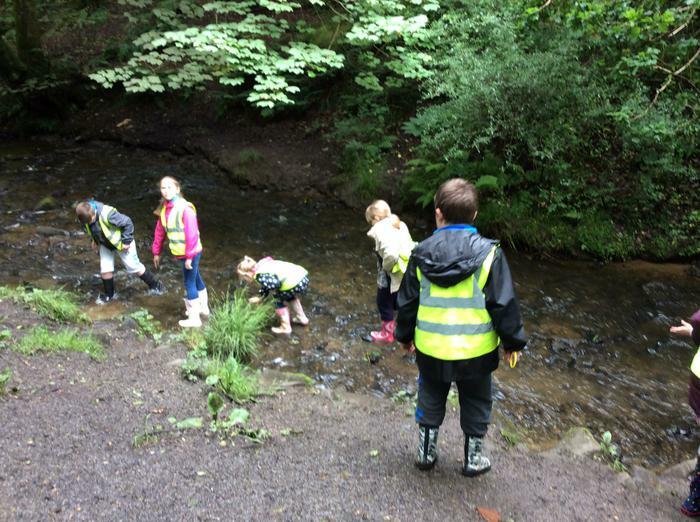 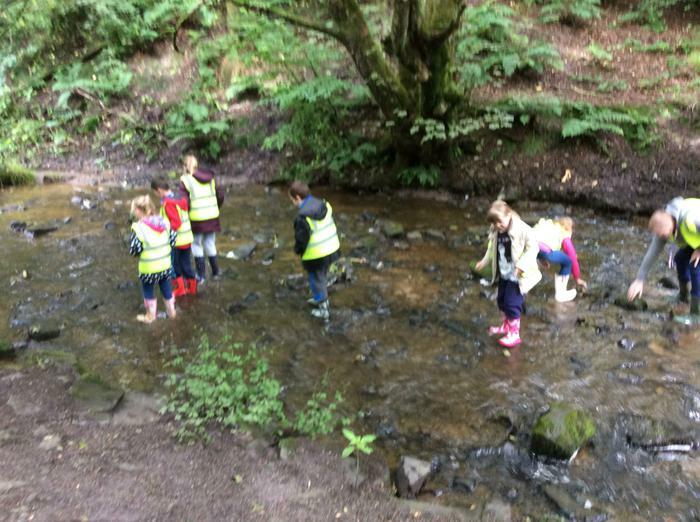 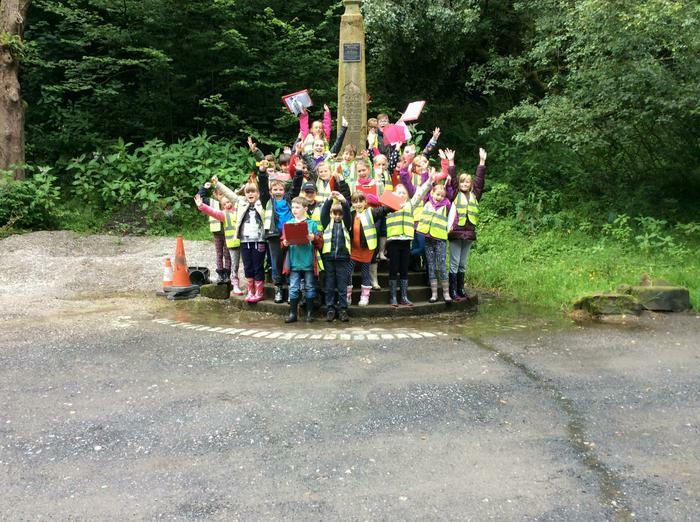 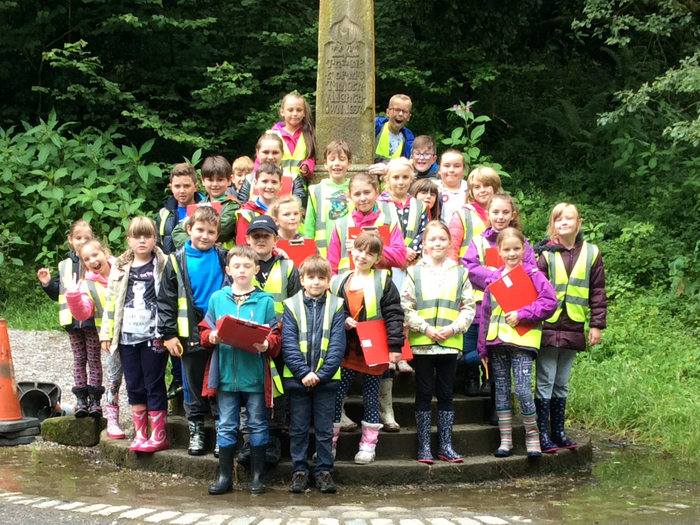 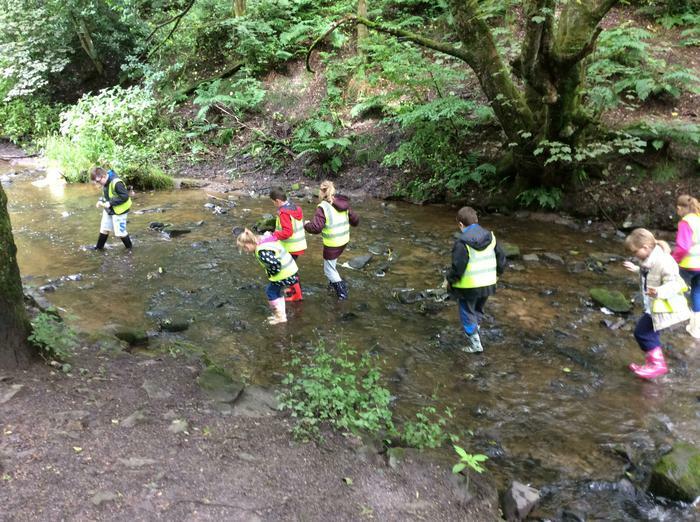 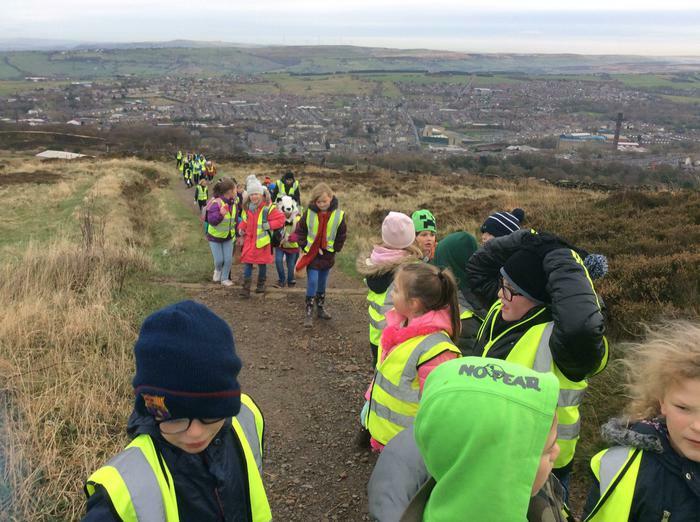 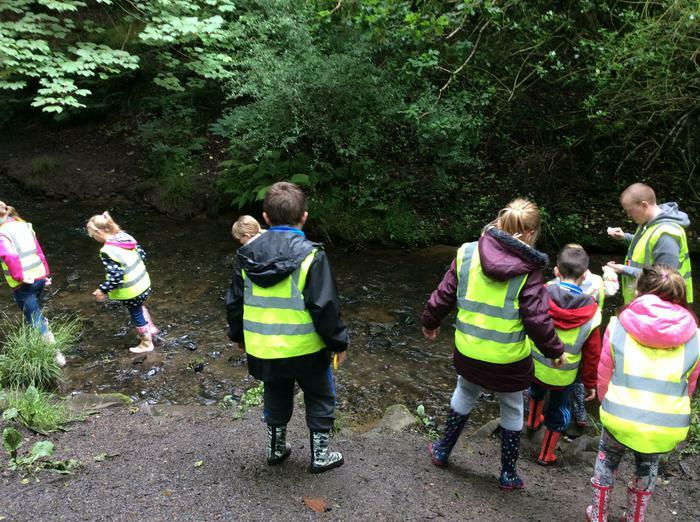 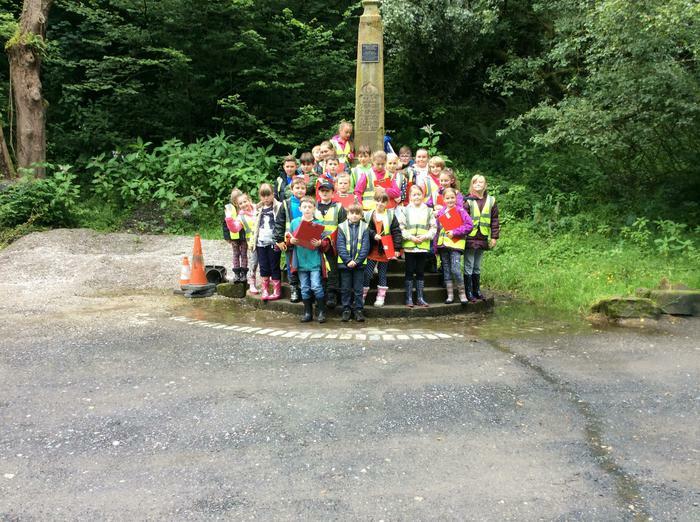 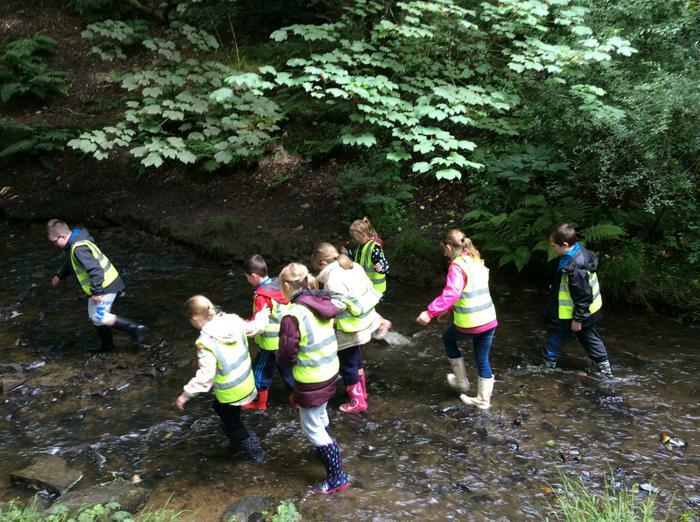 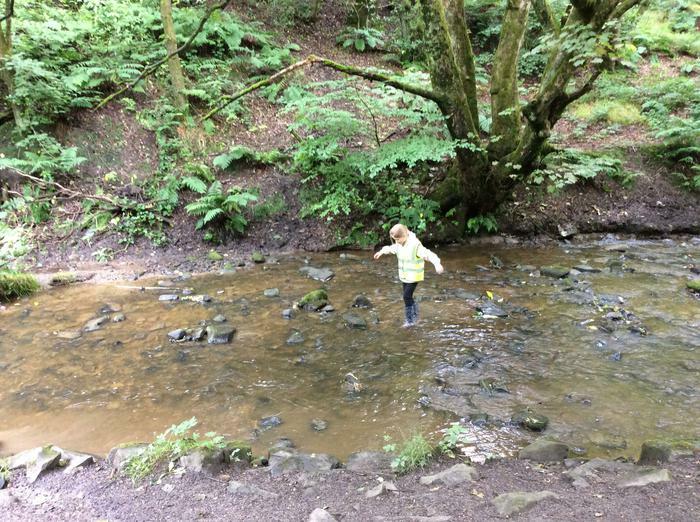 Today we went for a walk to Sunnyhurst Woods to finish off our science topic in class. 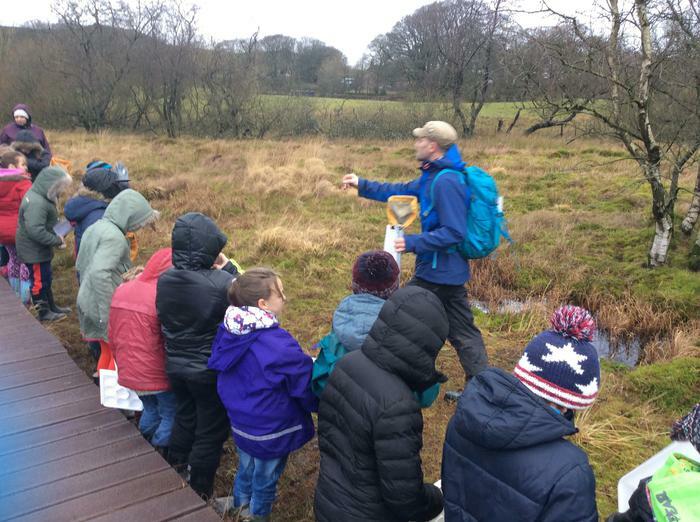 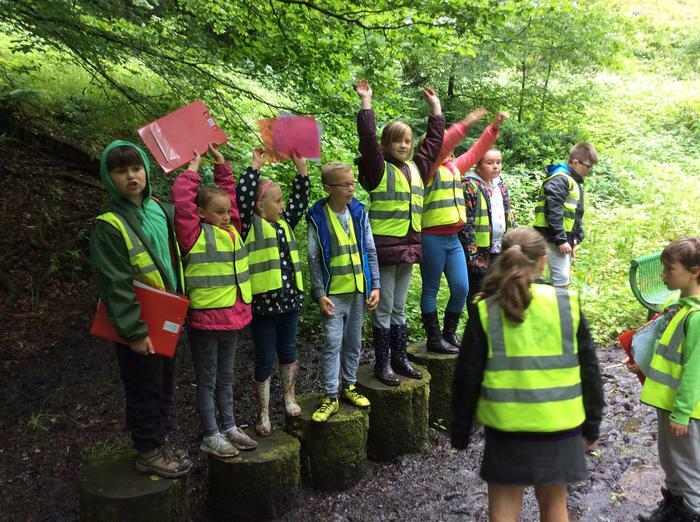 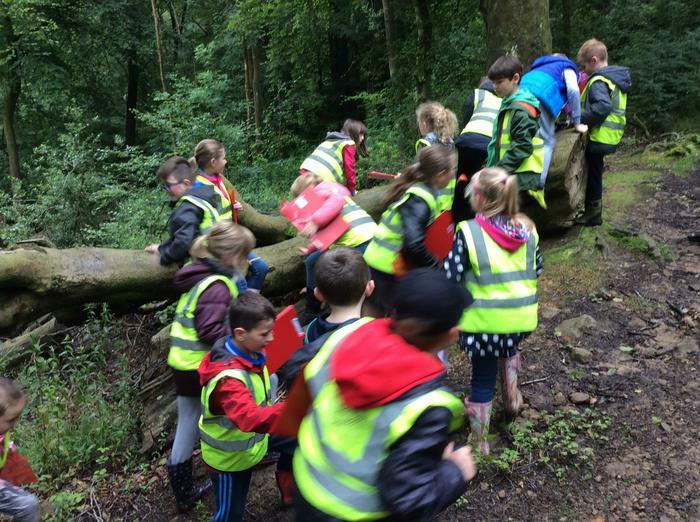 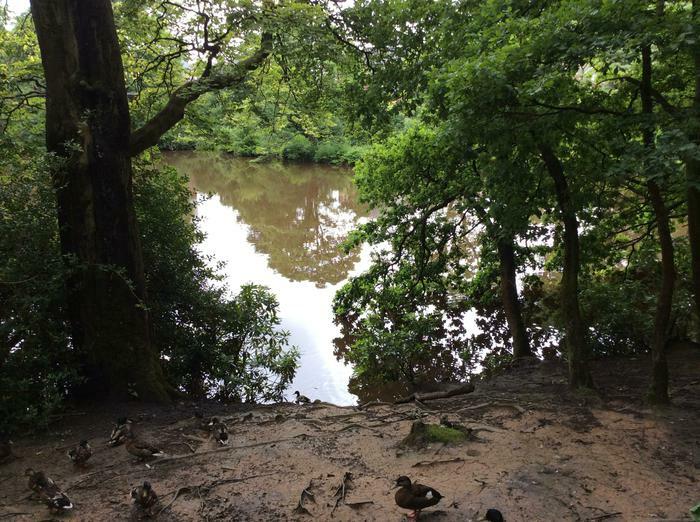 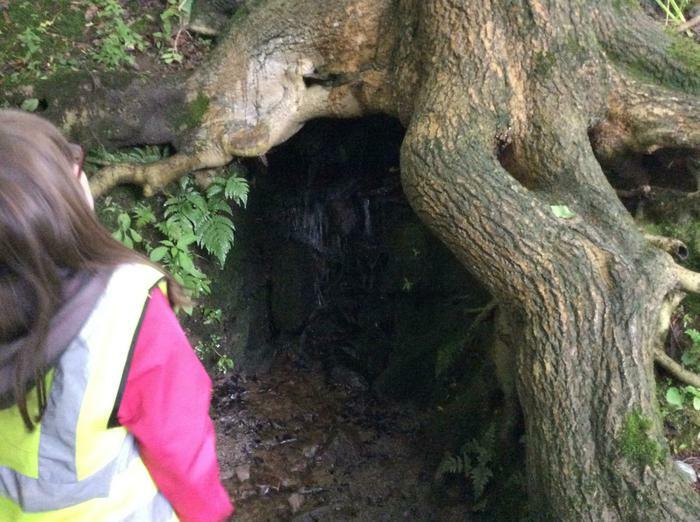 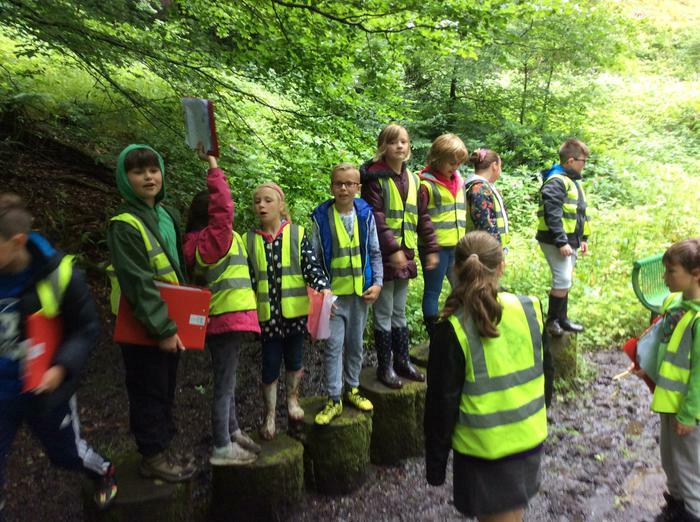 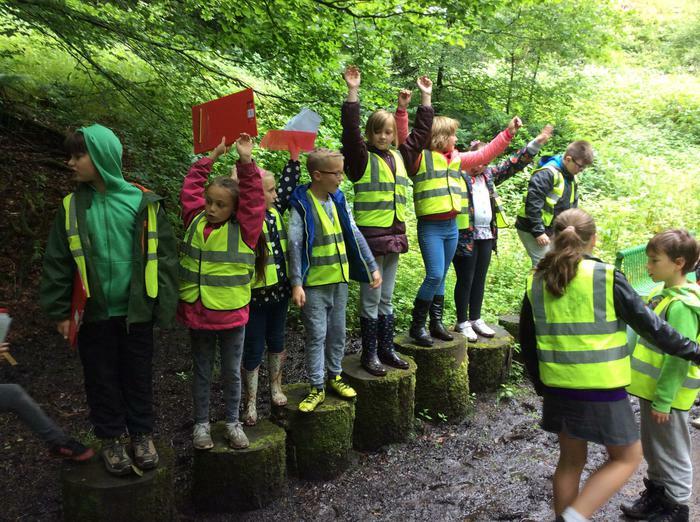 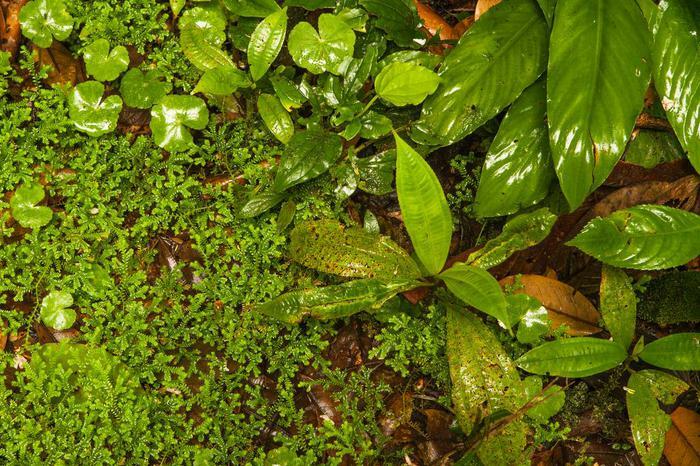 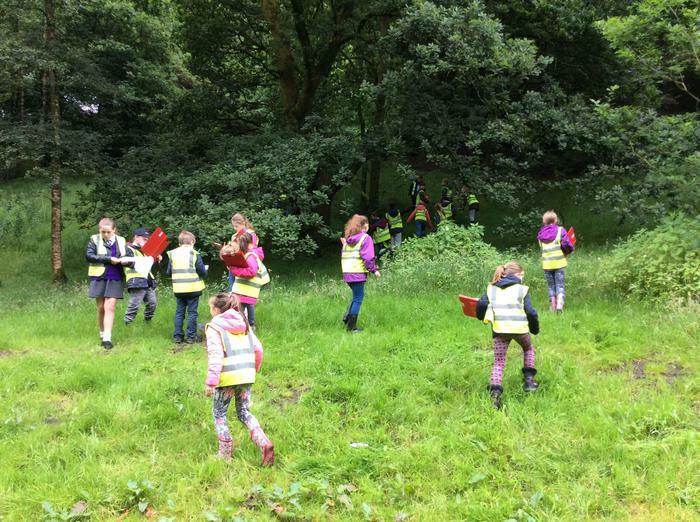 We have spent a lot of time throughout Year 4 looking at different habitats including Malham Tarn ponds, our school grounds and the Amazon rainforest. 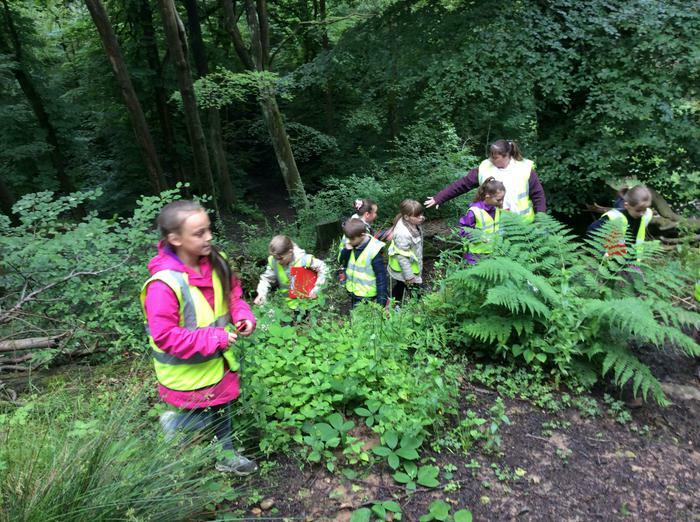 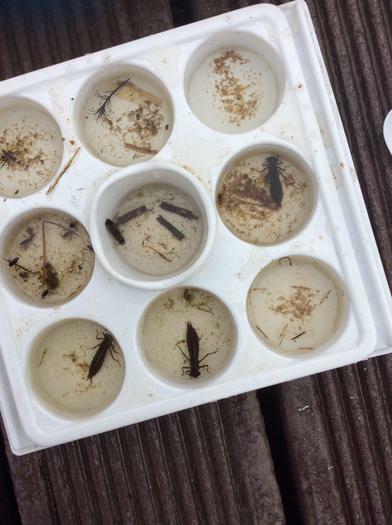 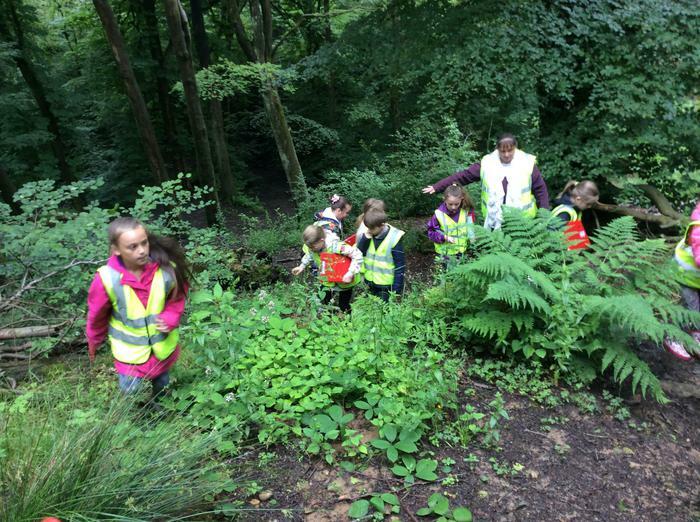 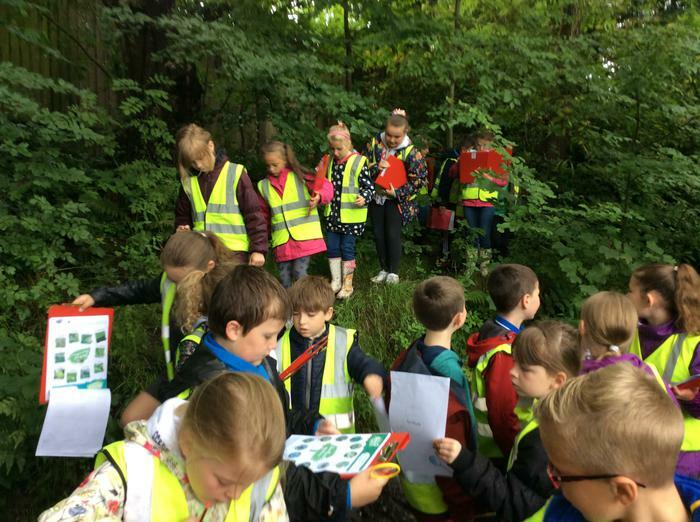 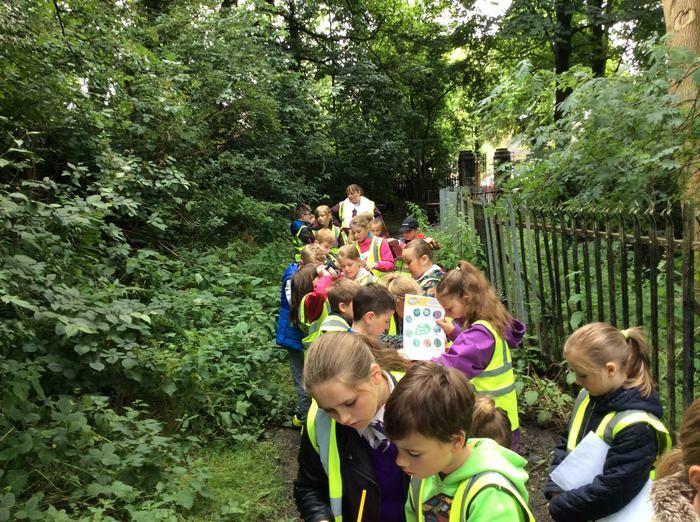 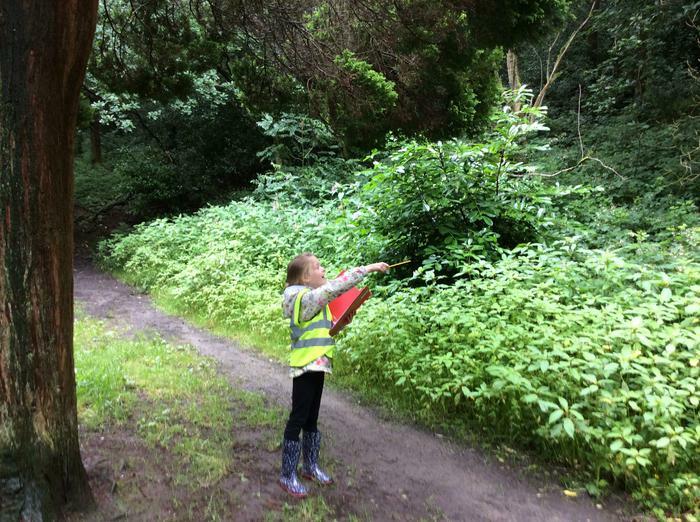 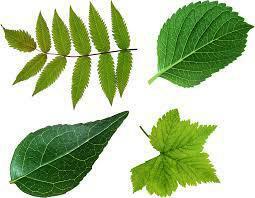 Today we decided to look at a woodland habitat and used checklists to look for certain animals, plants and insects. 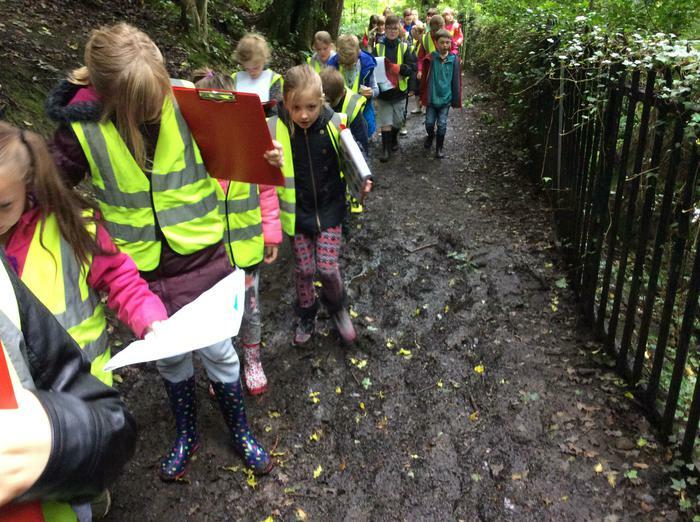 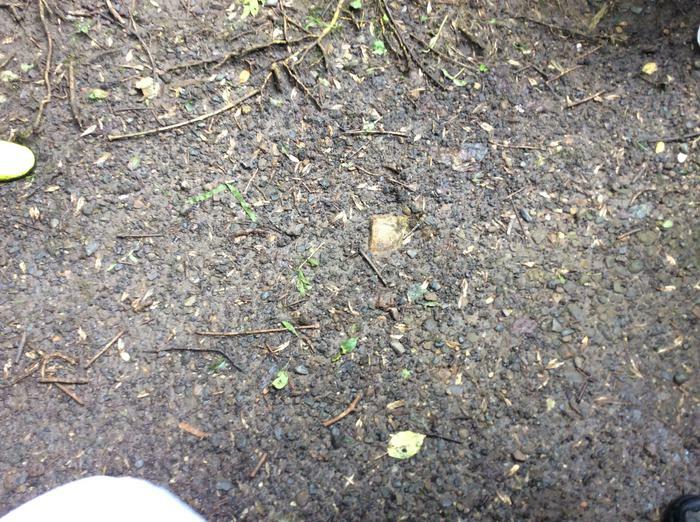 We even managed to find some unusual funghi and plenty of MUD.